I wonder if I can stay awake for 48 hours. Actually, I wonder if I can walk for 48 hours without needing any sleep. 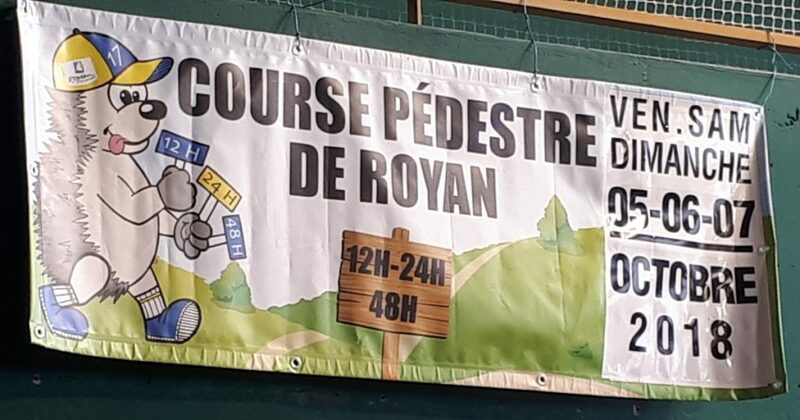 This is what I was thinking as I prepared for the 2018 edition of the Royan 48 hour race. 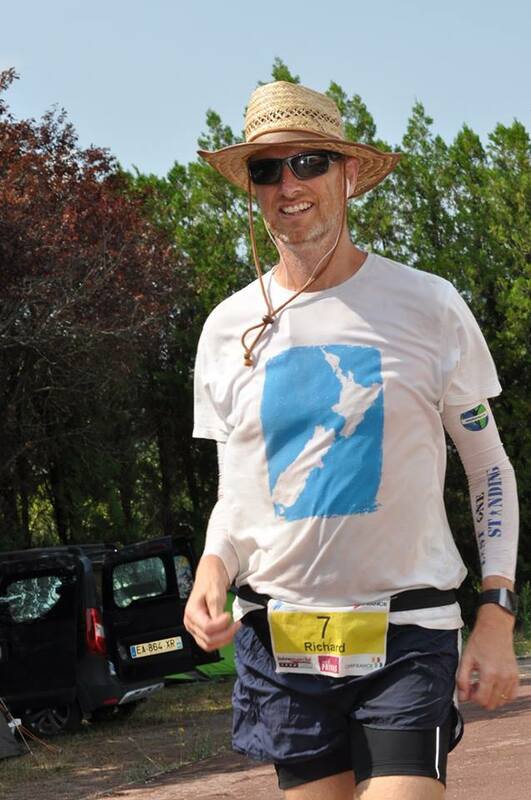 After finishing the 6 jours de France 6 day race in Privas, France six weeks earlier I had decided that my last race of 2018 would be an attempt to walk 200 miles (322km) in 48 hours on the fifth anniversary of my first 24 hour race – the Sri Chinmoy 24 hour race in Auckland, NZ, in 2013. 200 miles is a hell of a long way but if you don’t set big goals, you will never know just how far you can go. 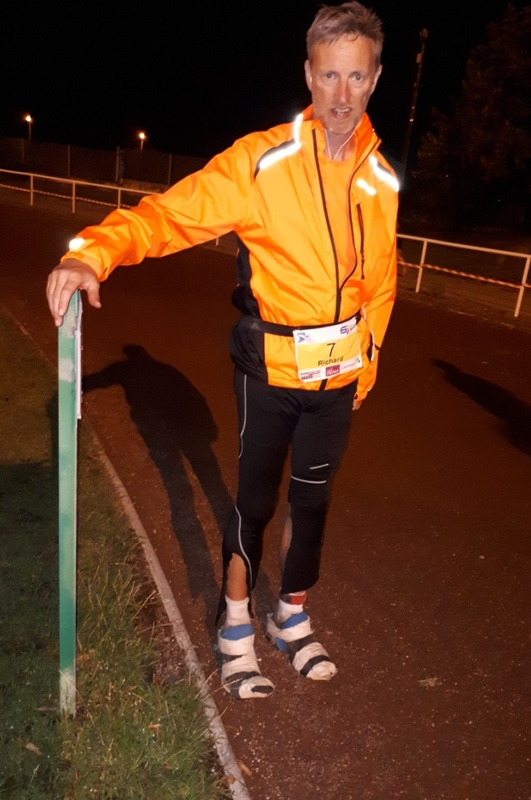 I had never competed in a 48 hour race but had an ‘official’ 48 hour PB of 241.1km from the first 48 hours at Privas this year, and an unofficial PB of 254km which was the distance I walked in 44 hours when circumnavigating the M25 motorway last year. Based on those results I figured that I should easily be able to walk 290km and if I had a great race, then I thought I could go significantly further. I had an experienced crew supporting me too, and that would make a big difference. 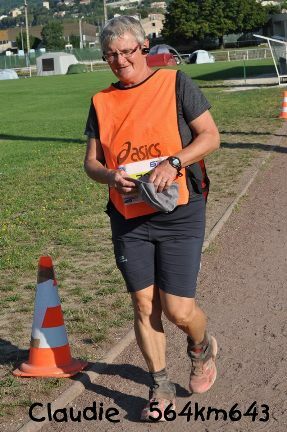 Kathy Crilley, an experienced long-distance race-walker and fellow Privas competitor would be supporting me before and after the 12 hour race that she was doing on the Saturday, and Jim Hanson, supporter of many athletes in many races including Privas, would also be my support crew. There job being to ensure that I lost as little time as possible when it came to eating, changing shoes and clothes, etc, and to give me encouragement when I needed it. 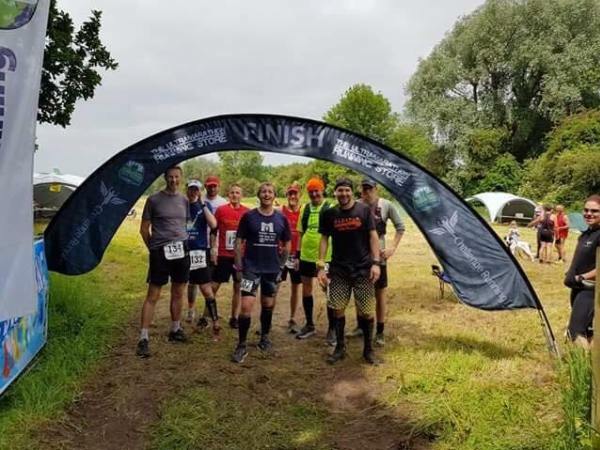 There were 34 runners and 17 walkers entered in the 48 hour race, starting at 10am on the Friday morning, plus another 67 runners and walkers in the 12 and 24 hour races starting on the Saturday. Our hotel the night before the race was just a couple hundred meters away and after a restless night’s sleep I went into town in the morning to buy some last minute suppliers before going to the stadium to prepare for the race. 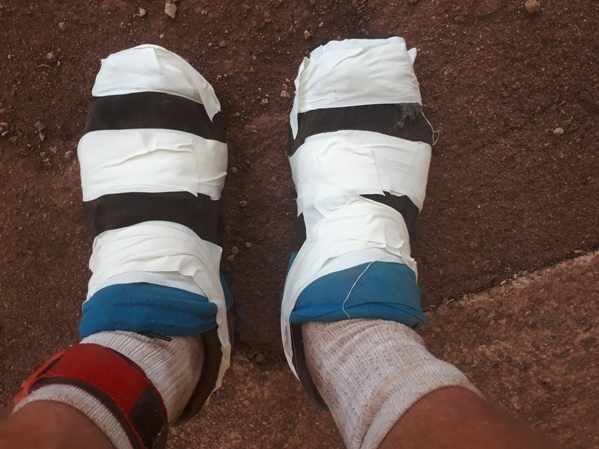 Because my feet hadn’t fully recovered from Privas I decided to use a combination of tape on my heels and 2Toms Blistershield on the front of my feet, and would wear just a single thing pair of Injinji toe socks rather than the double layer pairs of socks that I often wear in races. I sat in the sun and prepared my feet. It was already starting to warm up but the temperature wasn’t forecast to exceed 25 degrees – a cool day compared to what we had endured in Privas. The course was interesting, to say the least. Based almost entirely on a 400 meter track with an ash chip surface similar to the one that rips my feet apart every year in Privas, the 1.1km circuit included two 180 degree U turns and three sharp 90 degree turns per lap. The only time we left the track was just before the end of each lap when we walked down a gentle incline, turned a sharp right followed by another sharp right 5 meters later, then up and over the gentle incline again and a sharp left over the timing mats and into the 60 meter stretch of the track that was like a tunnel through a long marquee where all athletes had their food tables. It was not going to be a fast course. The race started at 10am on the Friday morning. As usual I started near the back and let the runners and some of the faster walkers go ahead of me. At the end of the second lap I was in fifth place amongst the walkers and without increasing my pace it was only a few more laps until I was in second place with three other walkers, including last years 48 hour winner, Dominique Delange, whom I had raced in Dijon in April, and last years 24 hour winner, Gerard Durand, not far behind. 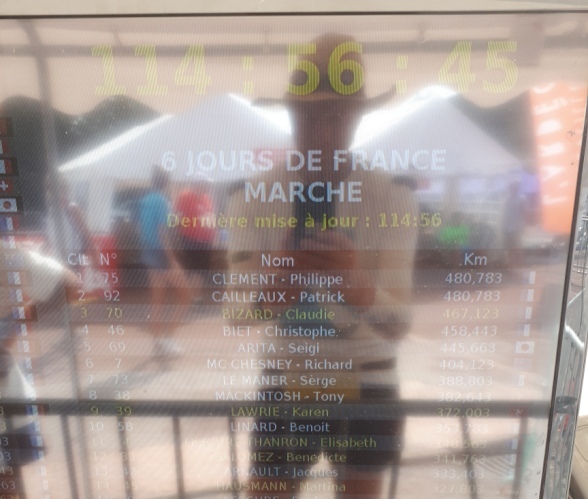 As the race progressed it became clear that a) this was a slow course and any chance of 200 miles was highly unlikely (I passed 50km in 6 hours 47 minutes which was below the pace I thought I would need), and b) the two walkers I needed to concentrate on were Dominique and Gerard. 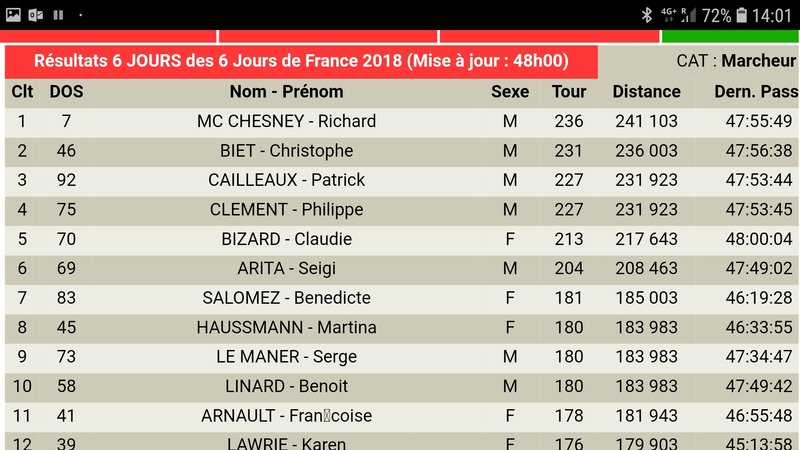 I reached 70km in 9 hours 47 minutes and had lapped everyone in the field except for Dominique who was about 50 meters ahead of me. 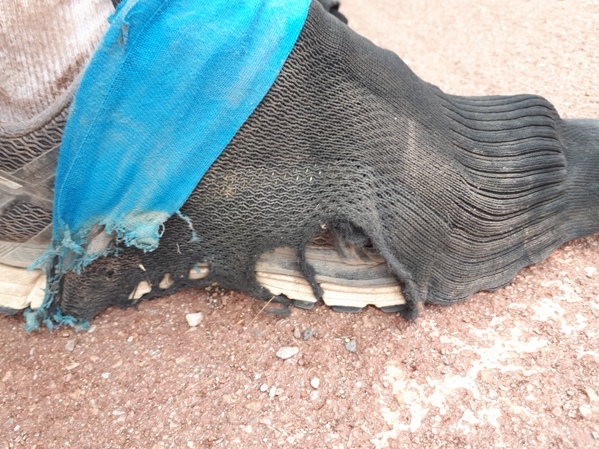 My shoes were beginning to fill with grit from the track so I decided to stop to empty them. This was my first stop in the race, and whilst it only took less than 5 minutes, by 80km Dominique had not only caught me but had passed me and put almost 5 minutes on me. I wasn’t feeling great. The 20km from 50 to 70km had taken 3 hours – 9 minutes per kilometre – and I started to let the negative thoughts creep in to my head. Thoughts like “I’m not cut out for these long distances” and “This race is too close to Privas and that is why I am struggling”. It was way too early in the race for negative thoughts, and in an attempt to get me out of my slump I had my first coke and some chocolate at around 10 hours. Much earlier than I would have liked but I needed the sugar boost. Fortunately, the bad patch didn’t last too long and then it was Dominique’s turn. I noticed that although I wasn’t walking any faster, the gap between myself and Dominique was decreasing with every lap. After walking over the timing mats at the end of each lap the electronic scoreboard would show your name, position and the distance between you and the competitor ahead. Slowly the time between Dominique and myself decreased until I had almost caught him at about 88km, and then a blister on the baby toe of my left foot popped. 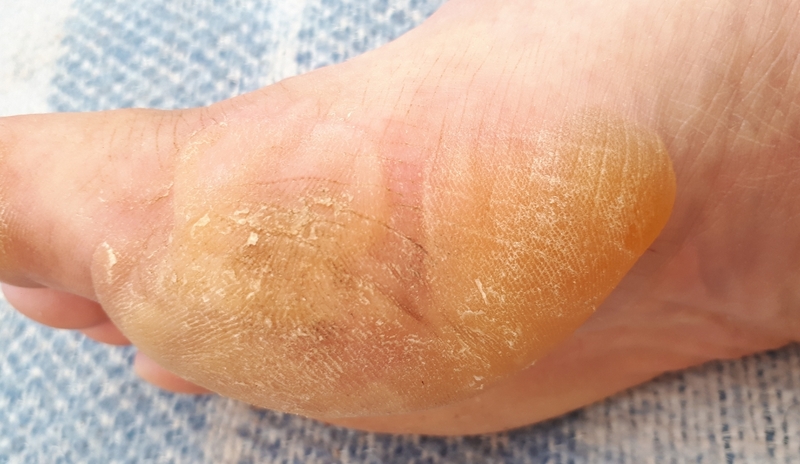 I have been having trouble with blisters on the small toes of both feet all year. I think they are caused by my shoes having a little less toe room since I got my orthotics, and this is something I am going to need to address over the winter – either larger shoes or a different model. Anyway, I hobbled around to the end of the lap and changed my left shoe for the one that I had cut the front out of at Privas. This meant for the first time in my life I was going to be wearing unmatching shoes. They were both Brooks Adrenaline but how would I account for this in my spreadsheet that records how far I have walked (or run) in every pair of trainers I have owned since 2006? I headed back out onto the track worrying about this and working to close the gap on Dominique again. I caught Dominique somewhere before the 100km mark (passed in a slow 14 hours 36 minutes – over an hour slower than what I was hoping for) and we began walking together. Dominique is shorter than me and without speaking we quickly worked out that it worked best if he walked behind me rather than in front. Walking side by side wasn’t really possible due to the five tight turns every lap, and given that Dominique didn’t speak English and I didn’t speak French, there was no real need to walk side by side anyway. Walking with me behind him often resulted in my lead foot touching the back of his trailing foot, so we moved into a position whereby I led and he sat right in behind me. We walked together for over 10 laps before I realised that he had stopped briefly at his food table as we completed a lap. 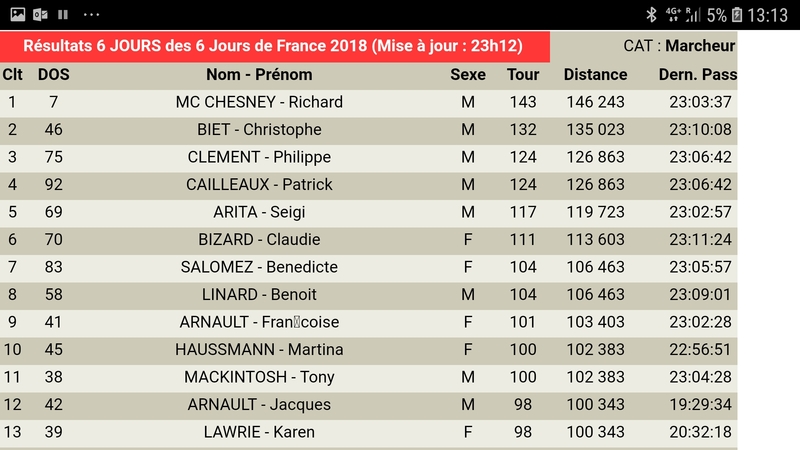 Without looking back I started to increase the pace and between 110 and 120km I managed to lap Dominique, and everyone else in the field, twice. I was feeling good and during the next eight hours I grew my lead as my competitors took breaks and possibly had short sleeps. 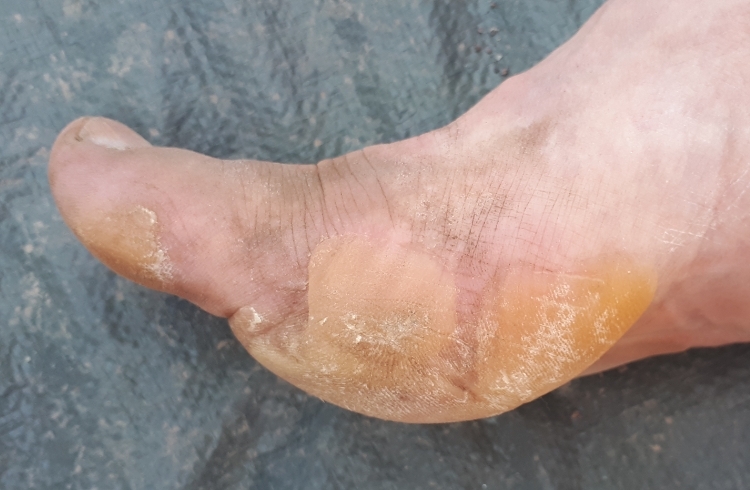 At 131km my mental problem with wearing shoes from two different pair was resolved when a blister on the baby toe of my right foot popped and I decided to change my right shoe as well. 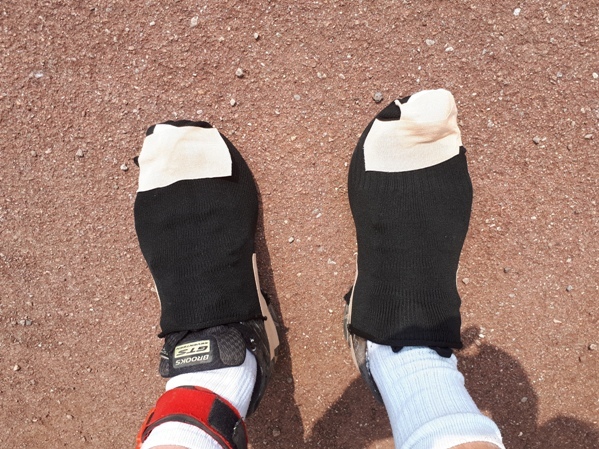 I also put a folded up sock on top of my left foot to give some additional padding between my foot and the shoelaces as I was feeling some pressure in the top of my foot. Nothing too serious, but enough to make my foot a little uncomfortable. By around 7am I started calculating whether I would make 100 miles before 24 hours was up. I had 21km to go to get through to 100 miles (161km) and three hours to do so. I was walking 10 to 10 ½ minute laps (9 to 9 ½ minutes per kilometer). 9 minutes per kilometer would mean that I would miss the 24 hour target by about 8 or 9 minutes. I needed to walk 8 ½ minutes per kilometer or faster so started to pick the pace up a bit. 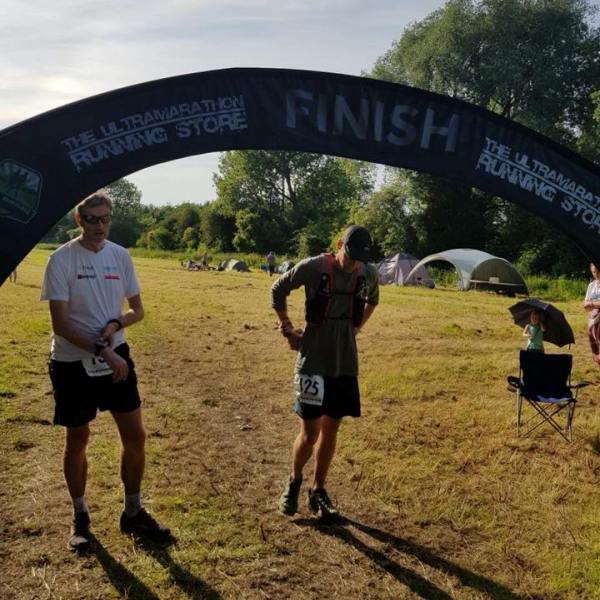 The faster I went the better I felt, and by the time the 100 mile mark arrived I was well ahead of schedule, passing 100 miles in about 23 hours and 44 minutes – which was just a couple minutes slower than the time I walked for my first 100 miler five years ago this same weekend. In that race I completed 162.885km in 24 hours and today I completed the 24 hour lap with a distance of 162.554km, just 331 meters short of my very first 24 hour race. To think that I could do that in the first half of a 48 hour race shows just how far I have come in the last five years. I checked the online results on my phone and was surprised to see that Gerard had now passed Dominique but more importantly, they were 20km and 21km behind me respectively. I knew it would be highly unlikely that I would achieve my goal of 200 miles, but 300km was well within my reach. Jim mentioned that the race record was 307km and I worked out that 9 minute kilometers would be sufficient to get the record. I reached 200km in 30 hours and 18 minutes. I was still leading Gerard by exactly 20km and Dominique was a further 13km behind Gerard. If I walked 10 minutes per kilometer I could still go close to the race record. I stopped for a celebratory coke and chocolate bar and that is when the rain started. Not just light rain, but a heavy downpour. I had been struggling mentally with the pressure of walking 9 minute kilometers on what was becoming an increasingly hard course. My feet were so sore that every one of the five sharp corners per lap was hurting, especially the two U turns. With the rain being forecast to last all afternoon and night I decided that this was my excuse to stop chasing the record and simply concentrate on winning the race. I had a lead of 20km (18 laps) and there was just under 18 hours to go. All I needed to do was walk at a speed no slower than 1km an hours slower than Gerard. For the rest of the day the rain was extremely heavy and blowing sideways for about 10 minutes at a time. It would then stop and the wind would dry us all out again. And then it would rain again. It took over 5 ½ hours to walk the next 30km. An average speed of slower than 11 minutes per kilometer, and that was without taking any significant breaks! I wasn’t enjoying myself, but I wasn’t not enjoying it either. It was simply a case of walking around a track and making the most of what we had. I reached 230km just before the 36 hour mark and Gerard was still exactly 20km behind me. He was walking faster than me, but was also taking more breaks than I was. We now had 12 hours to go and if he was to beat me he would need to walk 1 ½ laps per hour faster than me. I was becoming increasingly confident that I would win and wasn’t at all concerned about the distance. In fact I was now at the stage where I was thinking I would try and win by walking as few laps as I could. Often in races of 24 hours or longer I have seen walkers (and runners) develop a lean either to the left or the right. This is caused by weak core/abdominal muscles and can be quite comical to watch at times. During this race a couple athletes had developed leans and had a lot of difficulty navigating the U turns, and in other races I have seen two walkers walking together with one leaning to the left and one to the right. I don’t think I have ever had this problem in the past myself, but for some reason I developed a forward lean during the second night of the race, and whilst I was fully aware of it, there was nothing I could do about it. I kept trying to walk tall, but would quickly end up leaning forward again. Not badly, but enough for it to make my lower back sore. I don’t know what caused this. It could be due to not having fully recovered from Privas, or perhaps it was due to the many tight corners I had navigated. By the end of the 48 hour race I had completed 250 laps. That is 500 U turns and 750 sharp 90 degree turns. 1,250 turns in total, or one turn every 2 minutes and 18 seconds for 48 hours! No wonder I had developed a lean! Whilst Gerard didn’t speak much English he spoke a little, and at about 6am he told me that at the end of the next lap he was going to stop. Thank God, I thought. We had gone far enough that I would win and he would finish second even if we didn’t walk another step in the next four hours. He sat down at his food table and I did the same. After about ten minutes I walked back to see him and to confirm that he was definitely finished. Fortunately, Charlotte, a runner from London who spoke French was at the table next to him. She translated for me and the response was that we still had four hours to go and he was just taking a short break. Bugger! Daylight arrived around 7:30am and there was no sign of the rain letting up. It was also bitterly cold and we were all saturated. Many runners and walkers were off the track and I had convinced myself that it was actually dangerous for us to be out on the track as we were all so cold and wet. I thought the race organisers should abandon the race. I also, for some strange reason, thought that each lap was 5km in length and that in the time it took to walk a lap we could suffer severe hypothermia. For some reason I had forgotten that we were walking on a 400 meter track and could easily make it back to the warmth of the marquee and adjoining hall if things got too bad. I wouldn’t call it an hallucination, but I was definitely struggling to think clearly. I have no idea what speed I was walking but the pain in my feet meant that I wasn’t walking fast enough to keep pace with Gerard or to burn enough energy to keep warm. At the end of the next lap I decided that I had had enough. I was too cold and if Gerard could walk the 12 or so laps that he was behind me in the time we had remaining, then he could have the win. I was done! I walked in to the hall and compared to outside it was like a sauna. I changed out of my wet clothes, putting a thermal top and dry long sleeved top on, and also changed my socks and shoes. My feet looked terrible. 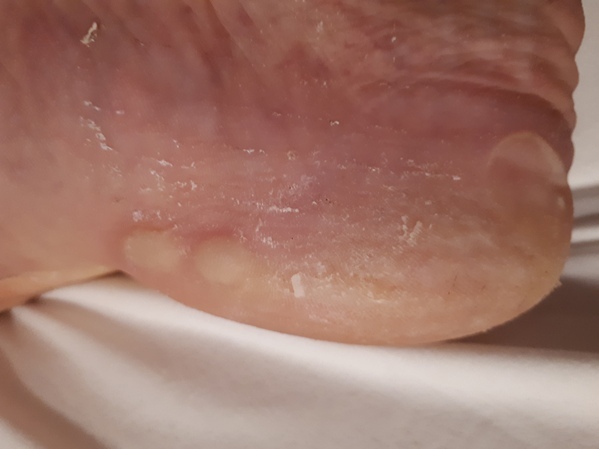 Huge blisters. But I was quickly warming up and decided to go back out and walk some more laps. I had noticed a plastic table cloth on the ground beside our food table, and with Jim’s expert tailoring we made a jacket to go over the top of the jacket I was already wearing. I walked for an hour or so. Nothing fast, and with a few short rests at the end of most laps. Once I got to 47 hours I decided that was definitely enough. I still led by about 8 laps and didn’t think that Gerard could possibly walk 8 laps in the final hour. 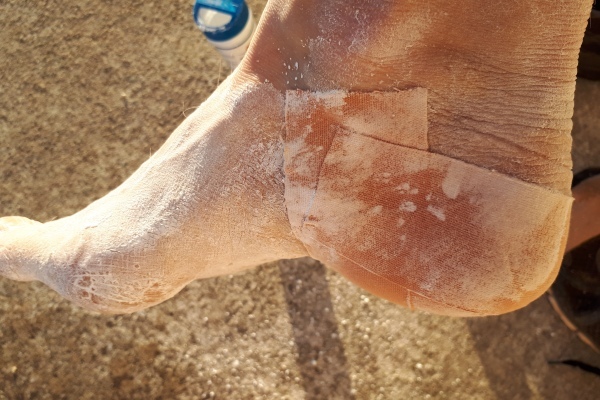 I also rationalised that if I finished early, I could see the medics to get my blistered feet dealt with without having to wait in a queue, and I could have a shower and then a short sleep before the awards ceremony. 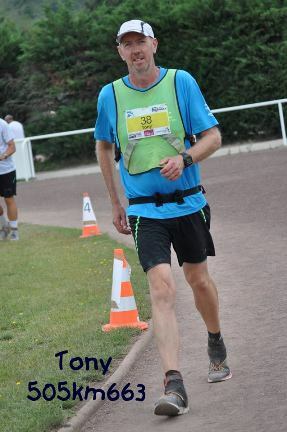 I was sitting talking to Jim and Kathy and to a French race-walking official whose name I don’t know, but I have seen him at many races over the years, and they suggested that perhaps I should go out for just one more lap. I would look silly if I stopped an hour early and Gerard caught me before the 48 hours was up. So I walked another slow lap and then came back into the marquee to sit down again. “What about one more lap just to make absolutely certain”, someone said. I agreed. What if Gerard could walk 10km in the last hour? He would catch me. So one more lap it was. And then on completing that lap I only 30 or 40 minutes to go, so no real point in finishing early. Why not just walk another couple laps? So in the end I walked right through to the 48 hour finish. Somewhere on the last lap Gerard caught me and we agreed to walk through to the finish together. A fitting end to a great race. My final distance was 278.466km (173 miles) against Gerard’s 271.784km. A win by only 6 ½ km, but a win is a win. Whilst I won the race, I am a little disappointed with my attitude and mental strength during the last 18 hours. It is easy to say afterwards that I could have gone further, but I do think I could have achieved 290km if I had been mentally stronger and continued to chase a distance rather than just the win. Given the weather conditions, 300km might not have been possible, but I’m disappointed that I didn’t push myself to find out what I could have done. I can say with absolute certainty that I will never do this race again. The surface, combined with the 500 U turns ripped my feet apart. The only thing I liked about the race was that because of the compact out and back nature of the course we got to see how the other competitors were going. Twice per lap you could see where you were compared to others and unlike other lap courses where I have focused on my lap times, I spent most of the race focusing on whether I had gained or lost ground on the various walkers I was watching during each lap. At Privas I found that I was unable to eat any chocolate. I just couldn’t face the idea. At Royan it was the complete opposite. After around 34 hours I found that I couldn’t swallow any food. Regardless of what I tried to eat, I would chew and chew and chew, and then have to spit it out. But chocolate – I couldn’t get enough. 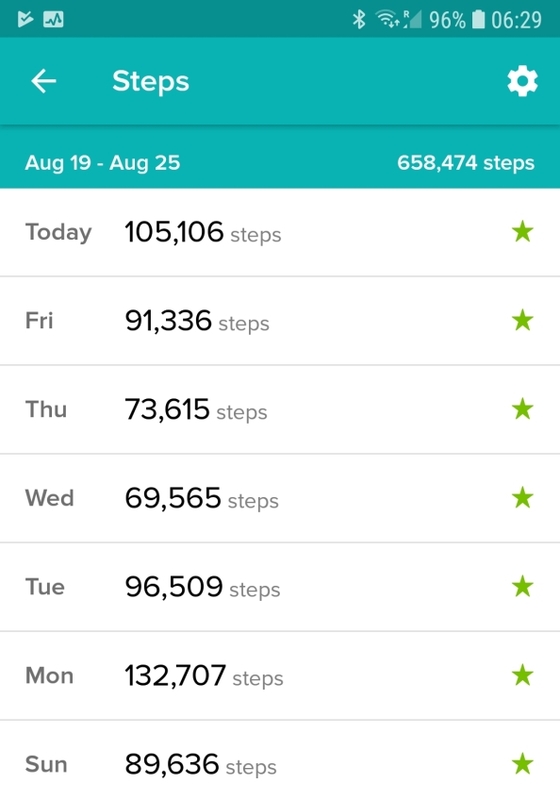 I managed a new single day PB for the most Fitbit steps in a calendar day – 167,000 steps between midnight on Friday and midnight on Saturday. This beat the 156,000 steps I walked in the same period during my M25 circumnavigation last year. In total I walked 316,000 steps during the 48 hour race. From when I woke up at 7am on the Friday morning (6am UK time) until I went to bed at 11pm on the Sunday night after arriving back home, I had been awake for 65 hours with just a 5 minute nap before the awards ceremony and a 45 minute restless sleep on the flight home. This has given me confidence that I can do races of 48 hours or even longer with no sleep in the future. My next race will be the 214 mile (344km) Belfast to Dublin to Belfast race in March next year and based on this I think I could possibly do that race on no sleep. I need to create a checklist of all the equipment I should be taking to races. For this race I forgot to take cotton T shirts for the hot weather on the Friday, although that wasn’t really a major issue, and didn’t take a jacket to survive the cold and rain on the second night. I also forgot my elastic belt that I attach my race number to. 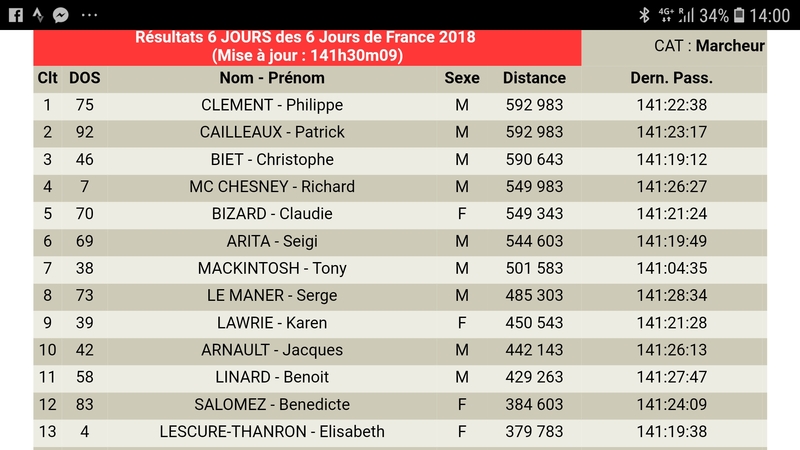 From my first race of 2018 in Dijon in April through to this race, I have competed in five races this year, totaling 11 ½ days in duration. I have finished with three wins, a 4th and a 5th Not a bad year. This is my last race of the year. I need to have a proper break to recover from some minor injury complaints and most importantly, to give my feet plenty of time to full recover. I’m unlikely to do a six day race in 2019 and instead I would like to do six or seven races ranging in length from 24 hours through to 250 miles (400km), but other than Belfast to Dublin to Belfast I’m not yet committing to any races for 2019. 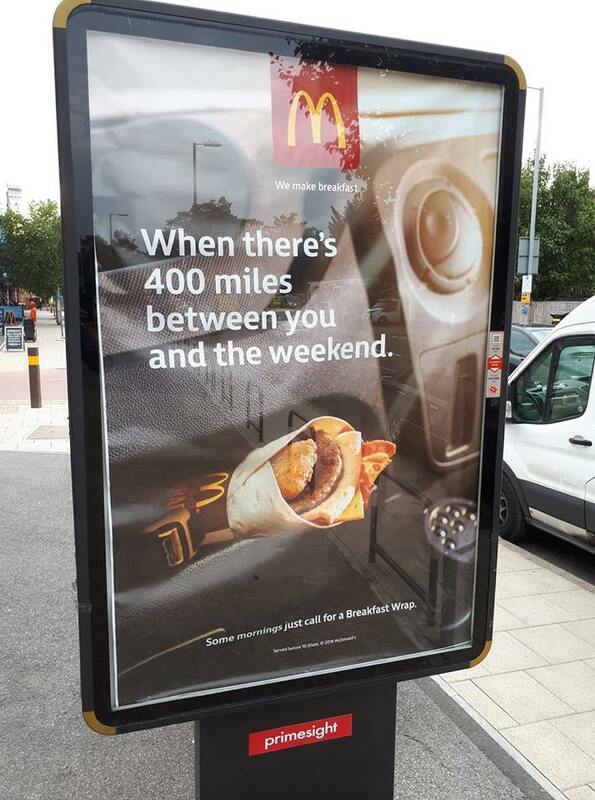 They could have been talking about my 6 day race last month – Except I only managed 351 miles (564km) in the 144 hours from Sunday afternoon, 19th August through to Saturday afternoon, 25th August. My race started and ended with McDonalds and included ‘Chicken McNuggets and Pasta” for dinner on one night somewhere in the middle. Six days. 144 hours. It’s a long time to spend walking. And it isn’t as if we go anywhere during the six days – the race is held on a 1,020 meter circuit in a stadium in Privas, France. Do the maths – 564km divided by 1,020 meters is a lot of laps! 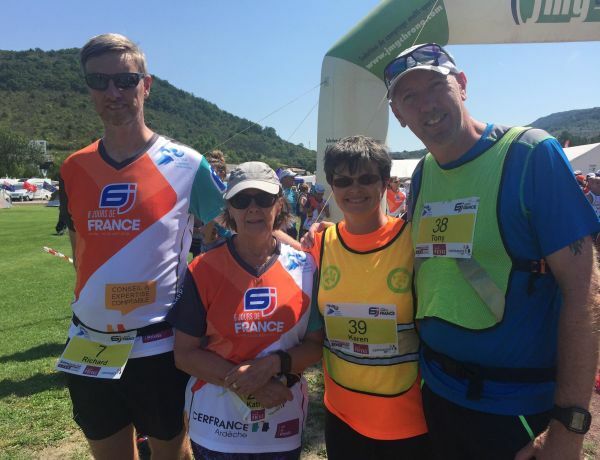 This year was my third 6 jours de France and my fourth visit to Privas – in 2015 I competed in a 72 hour race as I didn’t think I would be able to handle a full six days. 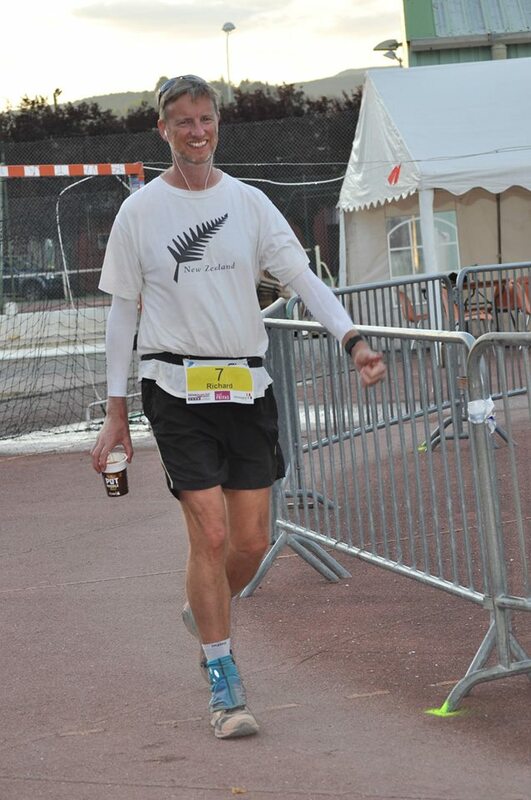 In 2016 I competed in the six day event, finishing 3rd walker, narrowly missing my goal of the New Zealand 6 day record (I completed 614km, 8km short of the record). And last year I only managed 500km after suffering through a heatwave. After the 2017 race I said I would never do the race again but within weeks I was already looking forward to the 2018 event. I don’t know what it is, but something keeps bringing us back each year. ‘Us’ being myself, Kathy Crilley and Suzanne Beardsmore – all race-walkers based in England. And the majority of the other competitors in the race, both the runners and the walkers, return year after year as well. It isn’t the course that brings us back – the track comprises a mixture of loose gravel, an ash athletic track, a little bit of tarmac, and some pot holes. 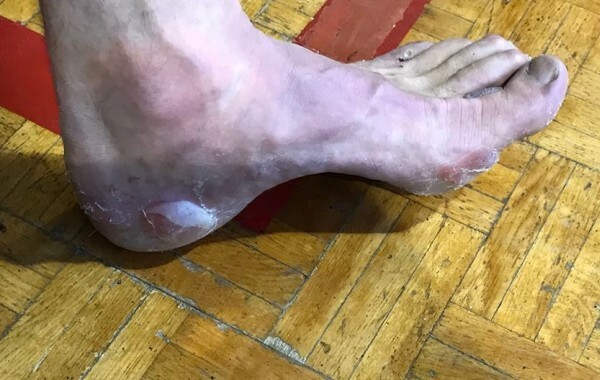 Most runners and walkers will have at least one visit to the medical tent during the race to have blisters dealt with. 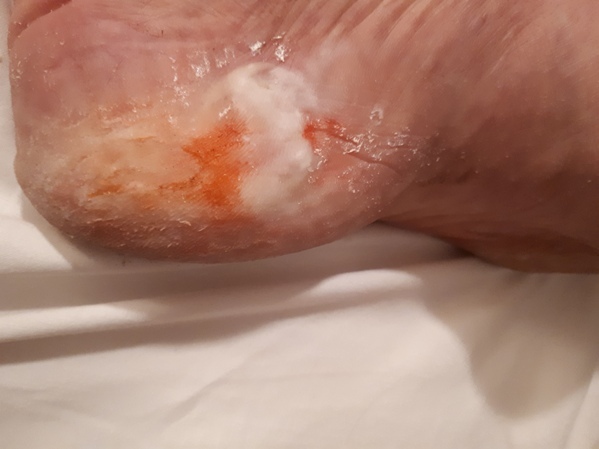 In my case, I have never had such severe blister problems so early in a race other than my four visits to Privas. It isn’t the weather that brings us back either. In 2015 we had a heatwave. 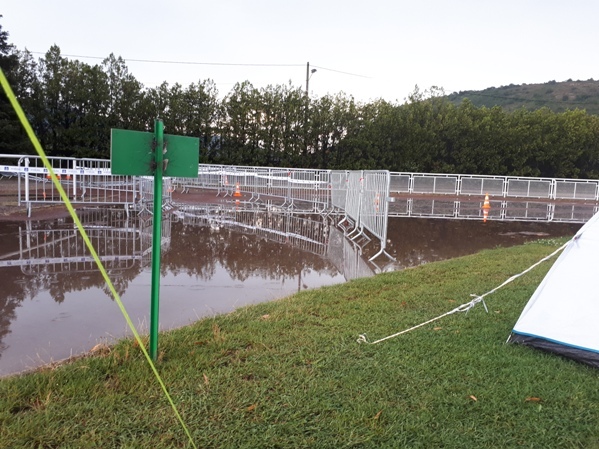 In 2016 we had three days of rain and flooding that meant we couldn’t walk on the athletics track for the first half of the race and in one section we had to walk along a wooden plank to avoid walking in ankle deep water. In 2017 we again had a heat wave. And this year it was a combination of heat and humidity that resulted in almost all competitors performing well below their PB’s. And it isn’t the toilet facilities that bring us back either – there are three separate toilet facilities at the stadium, but only one of them has one proper toilet. All the rest are squat toilets. In fairness, the race organisers do wash the toilets out with a fire hose every 24 hours ? So what is it that keeps us going back to a race that causes so much pain and discomfort? It is the people. The athletes, the organisers, the volunteers, and the support crews. Unlike a point to point course, a track event means that you are constantly passing other runners/walkers, or being passed. Regardless of your speed, there are always people to chat to. Sometimes just for a few meters or minutes. Sometimes for a couple laps. Whilst most of the competitors are French, and I don’t speak any French, there are still ways to communicate. Many of the French competitors also speak some English (which is helpful). This year there were five native English speakers – Karen and Tony from Isle of Man, Kathy and myself, and Sarah from Australia who brings a packet of Anzac biscuits for me each year. We also had Suzanne, Karen’s husband Dave and their children, and John and Lisa from Isle of Man supporting us, so plenty of opportunities for conversations in English. 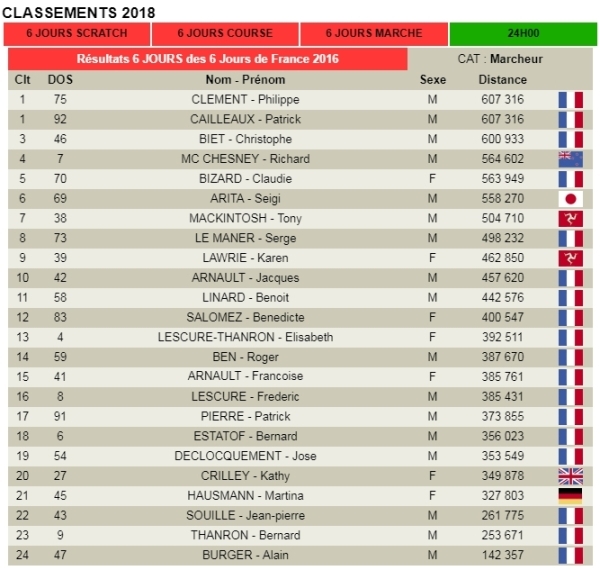 Then there were the two Japanese competitors – 78 year old Toshio Ohmori from Tokyo who was running his 8th 6 jours de France. He told me that he wants to come back two more times so that he can compete for the tenth time when he turns 80. And Seigi Arita, originally from Japan but now living in France. Other athletes included Phillipe and Patrick – 1st and 2nd last year who finished first equal this year. They spoke enough English to have one and two word conversations. Christophe who finished 3rd last year and won in 2016 would normally answer “good” or “yes” when I asked him how he was feeling or if he was tired. He finished third again this year. Sylvie spent as much time taking photos as she did running, but this year she remained in running clothing until the last couple hours when she dressed as a Jester and handed out confectionery to the competitors. In previous years she has been known to wear different costumes throughout the race. There are too many athletes to list individually but we all seem to know that we are suffering together and we all make the most of the situation. And then there are the guys in the medical tent. If it wasn’t for them, most of us would not be able to complete the race. 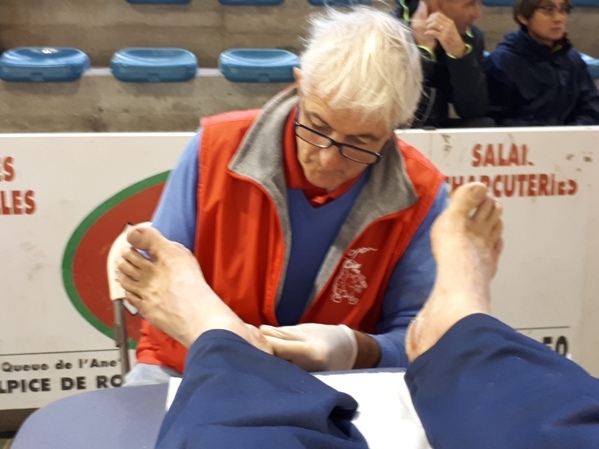 I’m not sure how much time I have spent in the medical tent during my four races in Privas – probably ten or more visits – and every year the same medical team are there to help us. This year there was one volunteer who worked on the drinks table. She didn’t speak English but loved my accent, and even when she wasn’t working and was out on the course offering support, whenever she saw me she would call out “what do you drink?” and wait for me to reply “Coca Cola”. This year was the first year that we didn’t have disposable cups. I was number 7 which made it easy to find my cup in the middle of the front row. As per last year I traveled to Privas by train on the Friday before the race. Privas is in the South East of France and takes 12 hours or more to get there by public transport (bus from home to local station, tube to Kings Cross St Pancras station, Eurostar to Paris, Metro across Paris, High speed train to Lyon, smaller train to Valence and then bus up to Privas township). And then there is the trek to the hotel. 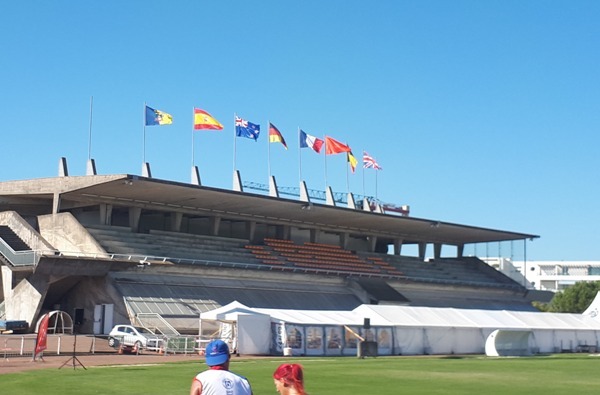 The stadium where the race is held is on the outskirts of Privas, and the hotel we stay at isn’t too far from the stadium, but is a 40 minute walk from the bus stop. This year, when I got off the bus Christophe was just arriving and pulled over to offer me a lift up to the hotel. 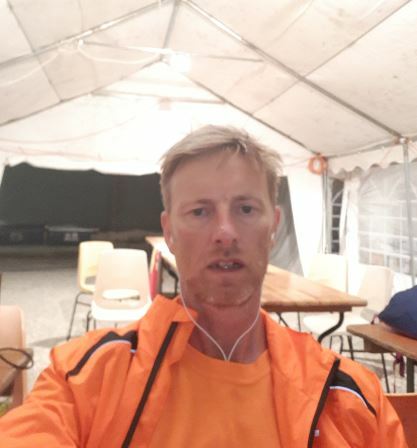 Christophe managed to explain, in his limited English, that he was feeling fit after doing a six day race in Hungary earlier this year and that he wasn’t going to stay at the hotel but instead would be sleeping in the back of his van tonight, tomorrow and during the race. Christophe dropped me at the hotel where I met Suzanne and Kathy who had traveled to Privas the day before. After a drink we walked down to the stadium to meet up with the Isle of Man contingent who had arrived earlier in the day. Tony and Karen, both accomplished long-distance racewalkers, would be doing their first 6 day race and were staying in Tony’s motor-home along with Karen’s family. Their friends Lisa and John were also with them and staying in Lisa’s van. 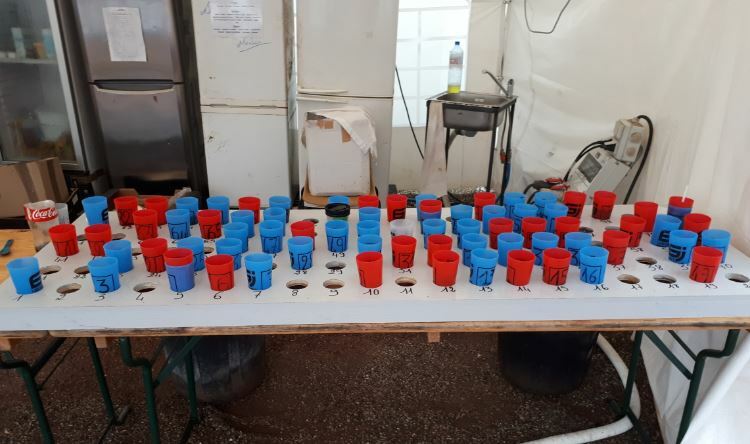 As is traditional, on Saturday all the competitors arrive at the stadium in the morning to set up their tents, park their motor-homes, or move in to their dormitory accommodation (camping stretchers in a dark, hot gymnasium next to the track). 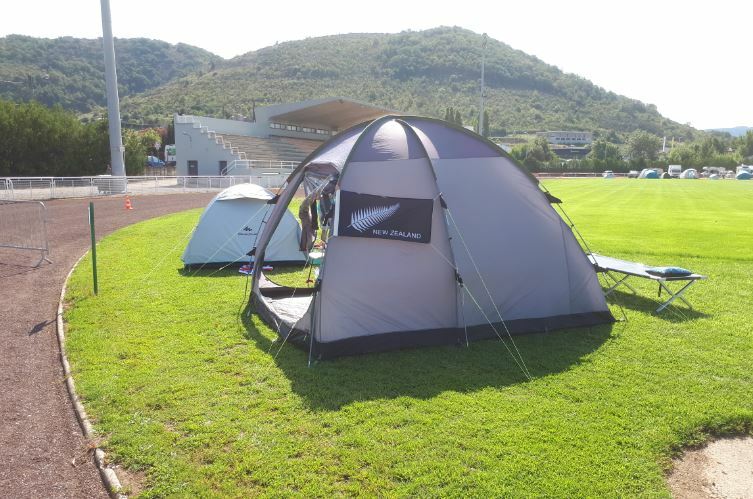 In my case I pitched my tent in the same place as last year – next to the entrance/exit to the athletics track which meant I could access it either when walking on to the track or leaving the track during each lap. 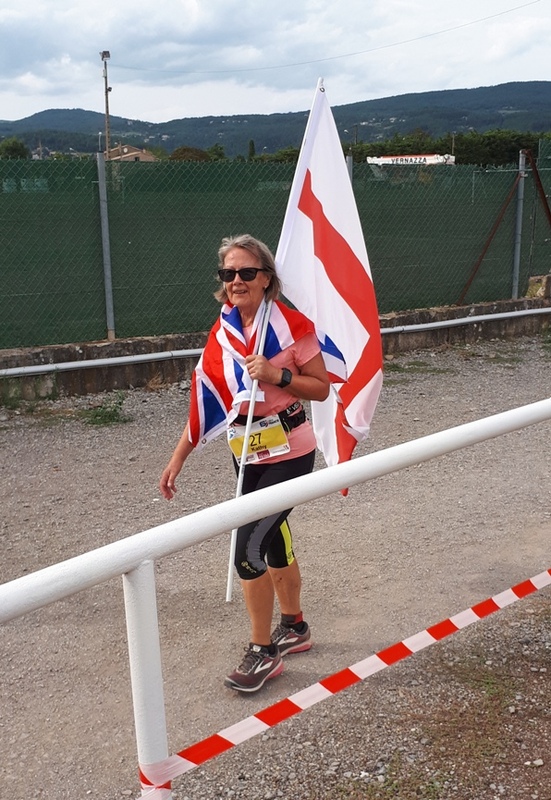 After pitching tents we went to the local supermarket to get supplies – in four years of going to Privas I have only seen the stadium, the supermarket, McDonalds, and the hotel – and then went back to the hotel to rest for the afternoon. We had dinner at the hotel that night and after initially struggling to get to sleep I managed to sleep soundly from about midnight through until the alarm went off at 7:30. Dave had a rental car for the week, so he came up to collect us after breakfast and we went down to the stadium to register and set about final preparations for the race. 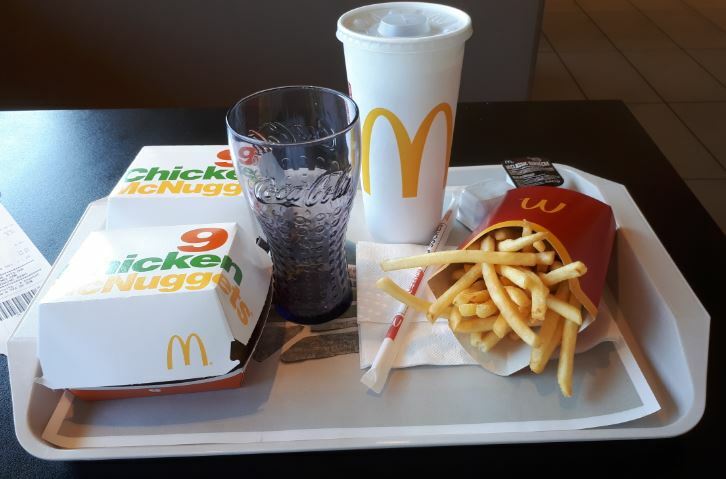 Part of my final preparations include a visit to the local McDonalds where I consume as many calories as possible and use a hygienic toilet one last time. My last meal before the race – and they even gave me a souvenir glass! The race started at 2pm. The temperature was already in the high 20’s, and there wasn’t a cloud in sight. After suffering through the heatwave last year I had a strategy which involved keeping myself wet, and rather than wearing one of the modern day moisture wicking T shirts that I normally wear, I decided to wear an old style cotton T shirt. I also had some white nylon sleeves that I could put on and take off as necessary, and a straw sunhat. My plan was to drench myself with water whenever necessary and to keep as much skin out of the sun as possible. I started the race slowly with the plan to just survive through the afternoon and then pick the pace up overnight. I intended to walk for the first 23 hours through to 1pm, and then sleep for three or four hours during the heat of the day. And then after that my plan was to walk to 1pm each day and sleep between 1pm and 5pm, and repeat. 1pm to 5pm being the hottest part of each day. 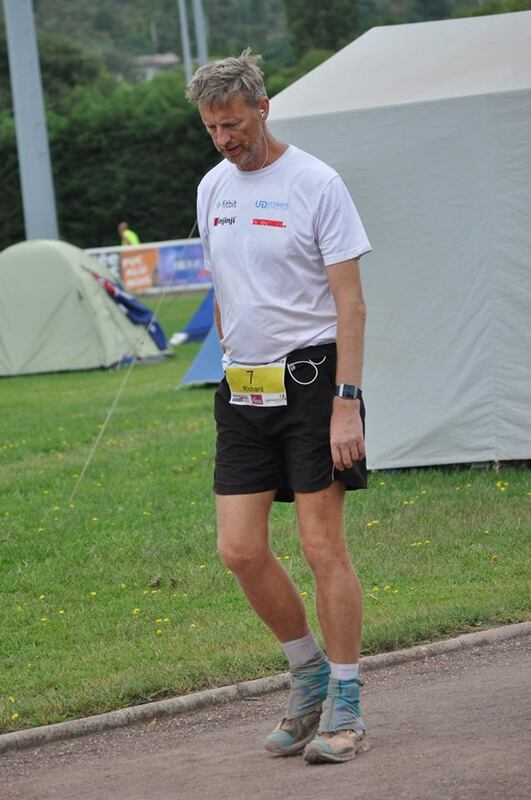 After the first two hours I was well back within the field of walkers– in 14th place having completed only 12.6km. It wasn’t until 11pm that I worked my way up to the front of the field, and that was only because some of the walkers were already taking breaks. 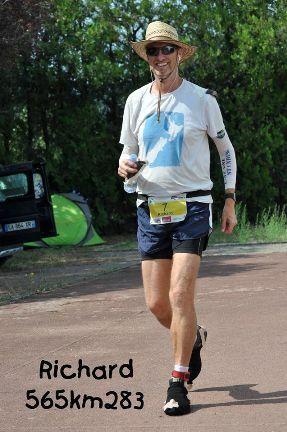 I reached 100km just after 5am (15 hours and 4 minutes) and at that stage I was well in front of the rest of the field. I was the only walker that hadn’t had a break during the night. It would be interesting to see how my strategy worked out over the next 5 ½ days. I walked through until 1pm as planned, covering 146km in 23 hours. In hindsight, perhaps I should have taken a break just a little earlier as I was struggling in the heat by the time I decided to stop. I took my air mattress up to the top of the stadium to sleep in the shade with a gentle breeze blowing over me as I did last year, but unfortunately the breeze wasn’t blowing in the same direction and the heat and humidity made it very difficult to sleep. I managed about 90 minutes of painful, restless sleep before deciding to resume the race. I washed my feet before going to sleep and let them get some fresh air while sleeping. Surprisingly, given the heat and the ground we were walking on, I was blister free. Even though I only slept for 1 ½ hours I somehow managed to spend 4 hours off the track. 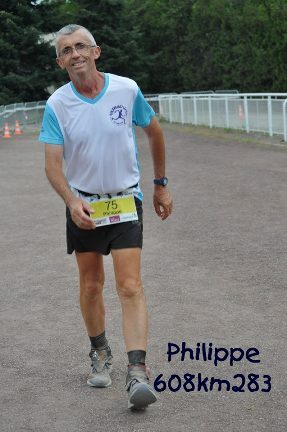 When I resumed I was 5km behind Christophe and just ahead of Philippe and Patrick who had stopped for their own rest. I felt good. My feet weren’t sore, and I was ready to put in some decent mileage through the night. I enjoyed the second night but didn’t manage to walk as far or as fast as I had hoped. I passed 200km in a shade over 37 hours and had a 30 minute break. I wasn’t tired sleep-wise, but I needed to rest my tired legs so I sat in the food tent with my feet up. 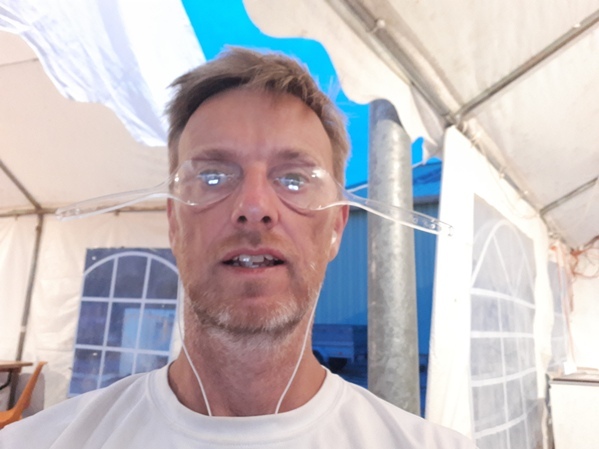 Even although it had taken over 9 ½ hours to cover the last 54km I decided that I would walk through until 2pm as I thought I would get in as much mileage as possible and maybe add some kilometers to my NZ 48 hour record from 2016. 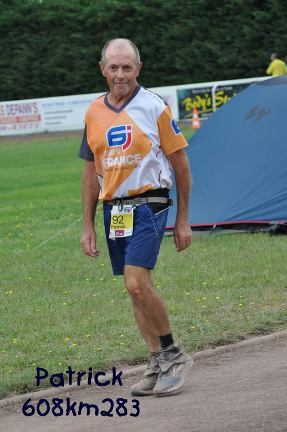 No New Zealander walker has ‘raced’ a 48 hour race meaning that the NZ 48 record is relatively easy – having only been set during longer races. 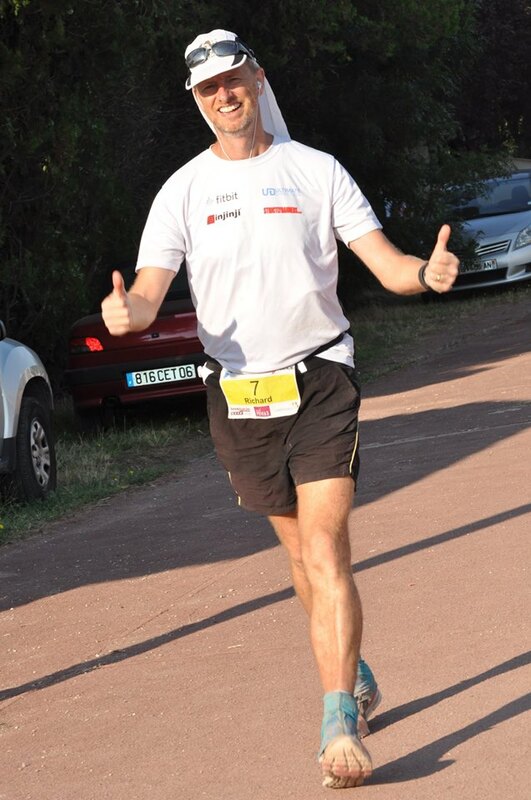 I first broke the record in 2015 and then again when I set the current record of 240.459km during the 2016 6 jours de France race. With almost 9 hours to go I figured that I could probably reach 250 to 260km depending on how hot it got during the day. 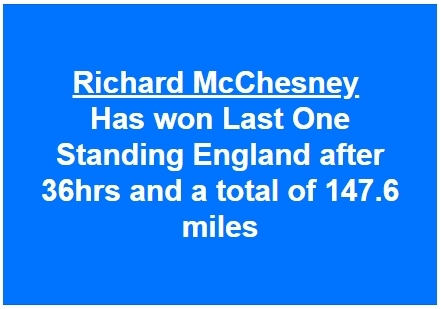 My best 48 hour distance is currently the 254km I walked when I circumnavigated the M25 motorway last year but records can only be claimed in races and race-walking records can only be claimed in races that also have race-walking judges. Around about 10am I received a call from one of my colleagues at work. Andrew wanted to check how I was feeling and we chatted for about 15 to 20 minutes. It made a huge difference mentally but physically I was already beginning to feel the heat again. I changed back into my cotton T Shirt and started the process of saturating myself with water every 20 to 30 minutes. The process worked along the following lines. I would pick up my water bottle at either my tent or our food table (wherever I had left it last time) and drink the remaining water in the bottle. Then shortly after walking on to the track, about half way through each lap, there was a water tap next to the entrance to the men’s toilets under the grandstand. When I arrived at the tap I removed my straw hat and sunglasses, filled my water bottle and poured it over the back and front of my shirt and both arms. I then soaked my head under the tap, put my sunglasses and hat back on, filled my bottle and started walking again. The whole process taking about 30 to 60 seconds. While walking I drank some of the water and then dropped my bottle at either my tent or the food table. In between these laps where I was ‘wetting myself’ I would have something to eat. Throughout the race I tried to eat a small amount every 30 minutes. As well as that, Suzanne prepared three or four more substantial meals each day. These were usually omelettes or pasta and for lunch we often had small pizzas which she purchased from the local bakery. We also ate many croissants and for breakfast most days I had instant porridge which I had brought with me from England. Snacks consisted of everything from crisps to biscuits, fruit (both dried and fresh – although my tongue became badly ulcerated on day two and I had to stop eating oranges because the citric acid was causing me pain), ham, cereal bars, and pork scratchings (I hate them but they are high in fat and calories and low in sugar). The one thing I couldn’t eat during the race for some reason was chocolate. I ate some chocolate on the first night and may have had one or two chocolate bars during the first few days, but for some reason I just didn’t want any chocolate this year. To limit my sugar intake, I tried to avoid drinking too much coke during the first two days but my coke consumption increased exponentially as the race went on. By the time 2pm rolled around I had reached 241.103km. Not the distance I was hoping for, but a slight increase on my previous NZ record. My distance for day 2 was only 95km. Well below my day two target of 120km. 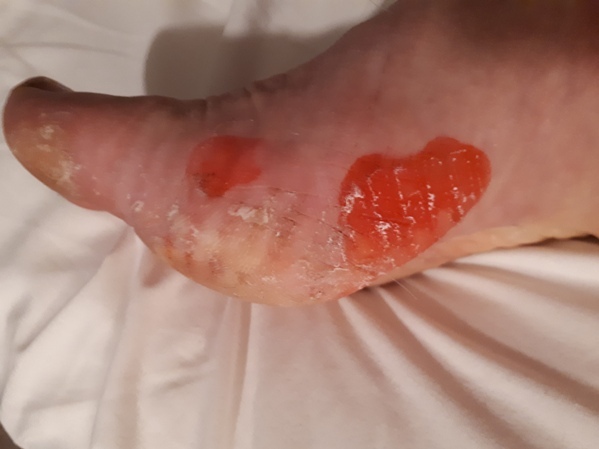 My feet were extremely sore and when I stopped at my tent to wash my feet prior to my scheduled sleep I discovered that they were a blistered mess. Rather than going to sleep I completed another lap to get around to the medical tent. One of the lessons I had learnt from the last few years of doing this race is that you don’t waste steps. The lap is 1,020 meters. If you are at your tent and you need to get to the medical tent, you do not walk across the rugby field in a direct line. Instead you walk the long way to complete a lap and ensure that every step counts towards your overall result. So I hobbled around to the medical tent wearing a clean pair of socks and a clean pair of shoes. 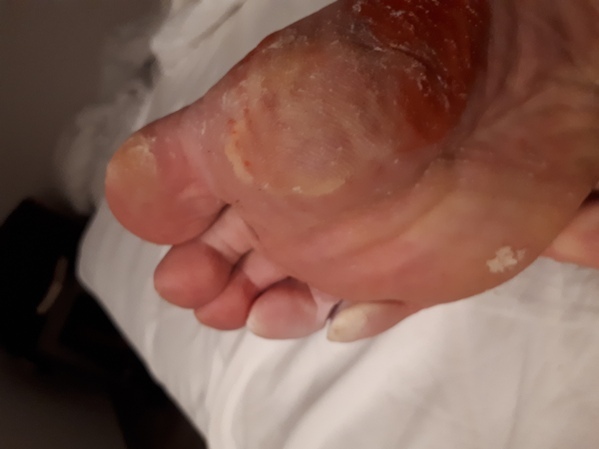 When I arrived at the medical tent the guys that have treated my blisters each of the last three years were there and once again they were ‘impressed’ with what they saw. Everyone came over to have a look and one of them took a few photos. They asked how long my feet had been like that. I replied that they had been painful for about 12 hours and one of them said I must have a very high pain threshold. I was off the track for about 4 ½ hours in total but probably only got about 45 minutes sleep. My body was extremely sore and it was too hot to sleep. 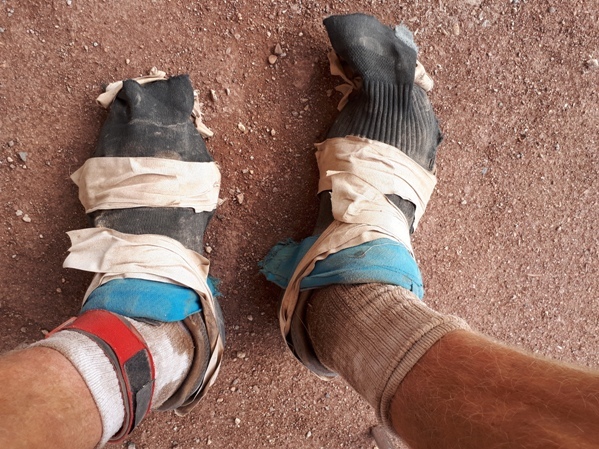 When I was ready to resume walking I headed back to the medical tent, as requested, to have my feet taped. After my first visit they asked me to let my feet air while I slept, hence the second visit. 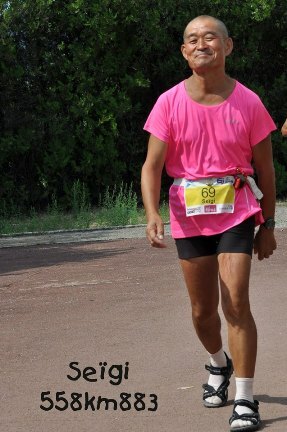 By the time I started walking again I was in fourth place, 9km behind Christophe and 8km behind Philippe and Patrick. 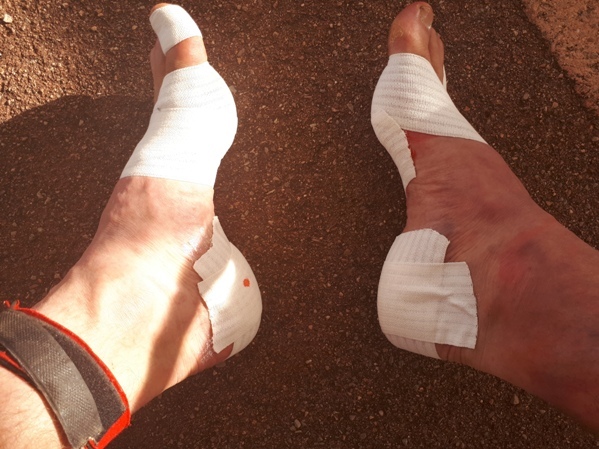 My feet felt much better having being taped and I had also changed to a pair of shoes with a slightly wider forefoot area. These were a pair of cheap shoes which I wouldn’t normally walk long distances in. They don’t have the same stability in the heel but I needed the extra room in the front of the shoe. 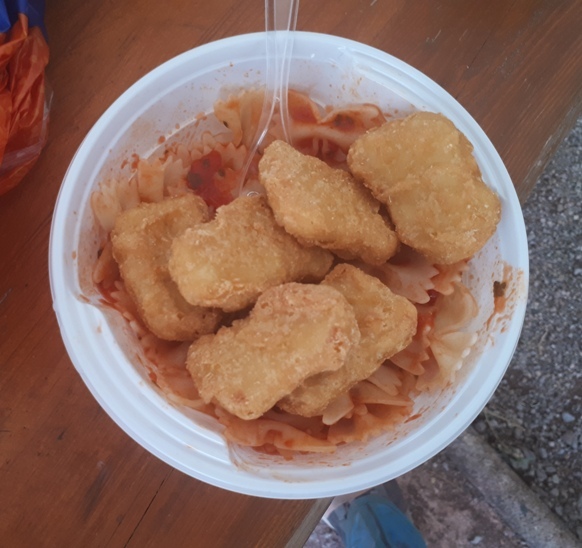 One of the highlights of the race came at dinner time when Suzanne offered me a choice of Chicken McNuggets or Pasta. I said I would have both! Possibly the best meal of the race. During the night I slept for two hours. It was just what I needed. The temperature was much cooler and I slept well although woke up well before my alarm went off. Maybe my idea of sleeping during the heat of the day was wrong. Perhaps it is better to sleep in the cool of the night when it is easier to sleep. Overall, I don’t remember much about day 3. The fact that it was uneventful was probably good, but my mileage for the day was well down on my expected mileage (at only 78.5km). Unlike previous years when I thought I was suffering alone I knew that everyone was suffering. You could see it in the results. At the end of day 3 I was only 4km behind the leaders. We were all struggling to put in the miles and the lead changed every time someone took a break. While I slept everyone else kept walking and by the time I got started again I was in 5th place and 20km behind the leaders. Claudie Bizard was in 4th place, 5km in front of me. 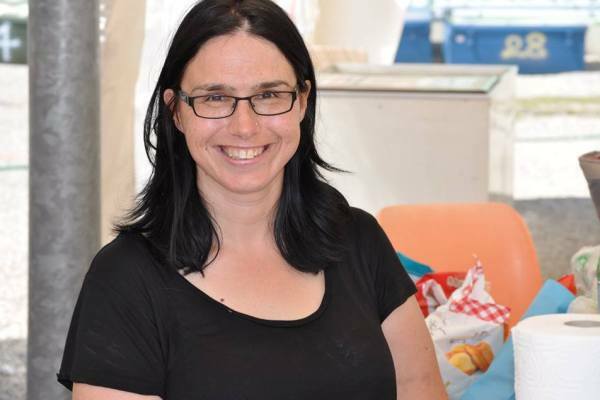 Claudie is the ‘official’ women’s world record holder for the 6 day event having walked 624km in the heat last year. 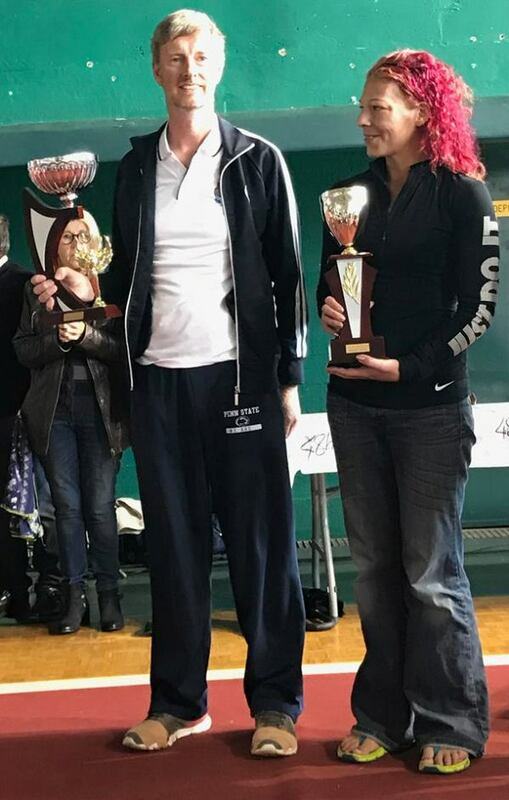 One female walker, Yolanda Holder from the USA, has gone further than Claudie but ‘official’ race-walking records can only be achieved in races that have walking judges, and Yolanda’s races have all being in the USA without race-walking judges. That isn’t to say that Yolanda isn’t walking, but her results, and the results of other athletes from races that don’t have race-walking judges, are not recognised by the record keepers. By 9:30pm I was dead on my feet. I was taking close to 20 minutes per lap and decided I needed another sleep. I was off the track for 3 hours in total, sleeping for about 2 hours and again waking up before my alarm went off. I lost another place with Seigi passing me as well, but when I resumed walking at 1am I was still 20km behind the leaders so wasn’t too concerned. I tried my best to make progress through the night but found it easy to take short breaks on a regular basis. One thing I did to keep myself going was put a message on facebook asking people to call me on facebook messenger. It was the middle of the night in the UK but a few people called me from the USA and NZ, which enabled me to walk without really focusing on it. Most nights I also spoke to my wife, Ruth, and my sister, Karen, called a few times during the race as well. All these calls took my mind of the monotony of the race, even if just for a few minutes. I got through to 391km by 12:30pm – although time was meaningless by this stage. By this stage it could have been breakfast time, lunch time, or dinner time. It really didn’t make a difference. It was either sunny and hot, or it was dark and cooler. My hip flexors had stopped flexing and I was struggling to put one foot in front of the other. Time for another visit to the medical tent where I spent the rest of day 4 getting a massage. At the end of day 4 I had completed 391km, covering only 71.5km for the day. Having slept during the night I decided to change my sleep strategy and resumed walking after my massage with the intention of sleeping again at some stage later in the night. I couldn’t get going though, and a little after 5pm I decided to stop walking and try and get some rest. I thought perhaps a shower might help and walked around to my tent to get my towel and some clean clothes. Whilst in the tent the wind started to pick up and I decided to tighten the guy ropes on mine, Kathy’s and Suzanne’s tents before having a shower. No sooner had I finished doing this and the storm hit! Torrential rain and strong winds ripped through the stadium. The race was abandoned as athletes and organisers tried to save equipment, tents, motor-home awnings, etc. 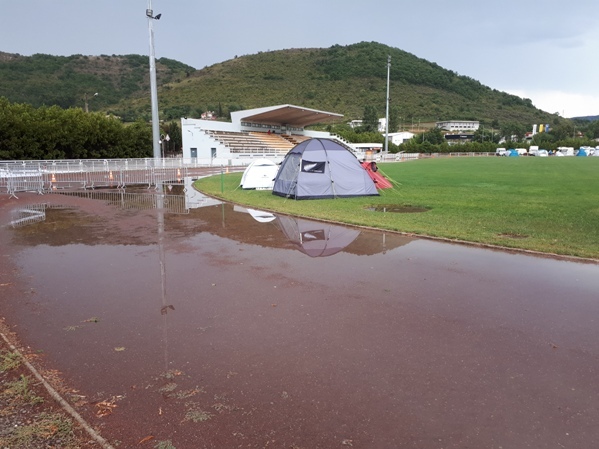 The storm probably only lasted 15 to 30 minutes but it flooded the athletics track and a number of the tents plus one of the race marquees were damaged. There was also a power cut and the race organisers quickly advised the athletes that the race was now ‘on hold’. 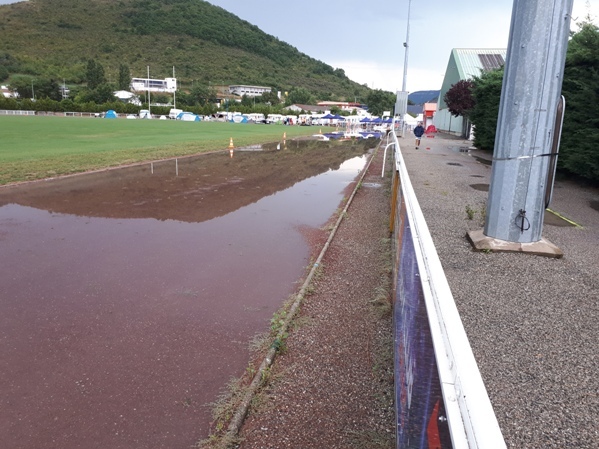 After two hours we were advised that we would resume shortly but on a shorter 620 meter circuit which would eliminate the flooded athletics track. During the break I decided that I had had enough and took up the offer of staying at the hotel for the night to get some proper sleep, have a shower, etc. 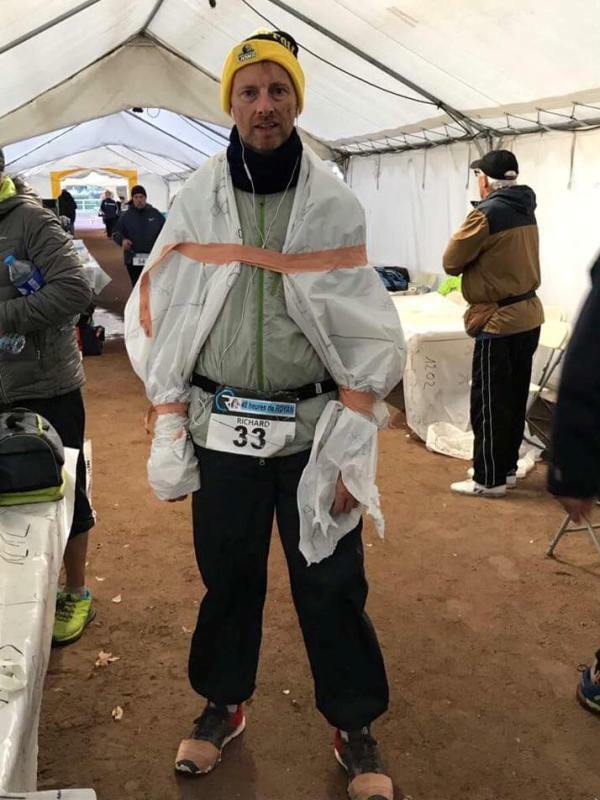 We were told that we had to be on the start line when the race resumed so I walked one lap of the 620 meter circuit and then Dave took me up to the hotel where I spent about an hour slowly removing the tape from my battered and blistered feet, and having my first shower since Saturday morning (it was now Thursday night). I slept for a solid 8 hours although my sleep was a little restless and I had serious night sweats, having to change sides of the bed at one stage. I’ve experienced night sweats after some races in the past. I think it is the body’s way of detoxing. Usually it lasts for one or two nights but this was the first time I had had night sweats during a race. Probably because it was the first time I had slept in a proper bed during a race ? I woke when my alarm went off at 7:30am and after another shower I limped down to the track – about 700-800 meters away. Mileage that wouldn’t be counted in my overall result ☹. I wasn’t in any rush to get started and after saying hello to Suzanne and some of the athletes I went to the medical tent to see what they could do with my feet. 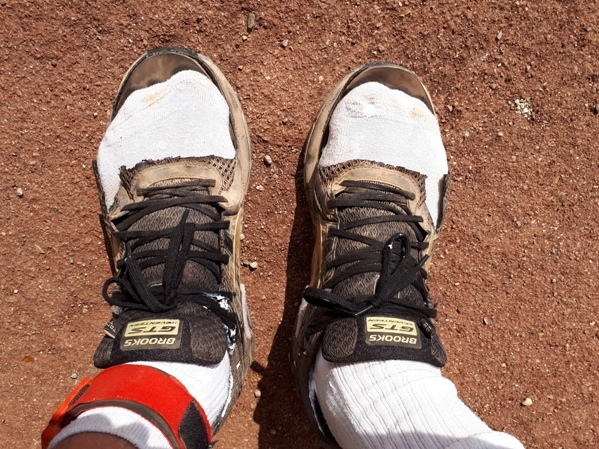 They cleaned up the blisters again and re-taped my feet, and then they suggested that cutting the front mesh section off each shoe would ease the discomfort. I was prepared to try anything to reduce the pain but wasn’t really intending to ‘race’ as such. My plans for the next 30 hours were just to circle the track and try and get a reasonable overall distance. After my visit to the medical tent I had brunch in the food tent and watched the athletes going past. Many of them waved and acknowledged me. I guess they had noticed that I had been missing for the last 12 or more hours. 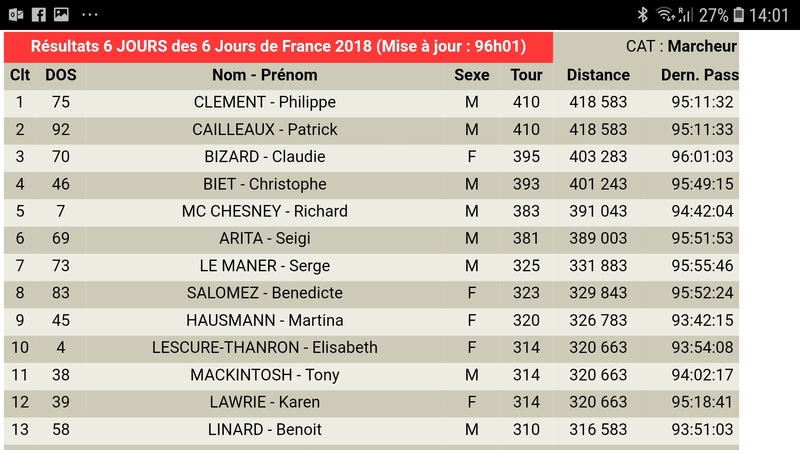 Philippe and Patrick were now on 480km, Claudie was in 3rd place on 467km, Christophe 458km, Seigi 445km and I was in 6th place with 404km – 76km behind the leaders! Not far behind me was French walker, Serge Le Maner, followed by Tony and Karen. My thinking on resuming the race was that I would try and walk fast enough to hold on to 6th place, and because I had had a good sleep I should be able to walk the remaining 30 hours without needing to stop for another sleep. 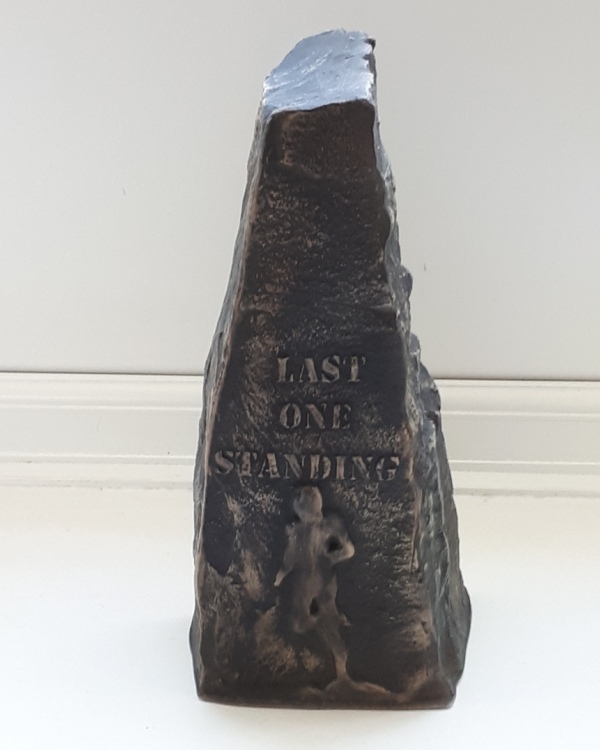 The race had been extended to finish at 4:30pm to give us back the 2 ½ hours from the storm delay, although for anyone wanting to claim any records their mileage as at 2pm on Saturday would be what counted. Three hours later, at 2pm (the end of day 5) I got a big mental boost when I thought I had picked up 10km on the leaders already. My maths wasn’t too good. I thought there had been an 80km difference at 11am and thought the difference was now 70km when it was actually 73 ½ km. In reality I had only picked up less than 3km on the leaders but in my mind I had picked up 10km! I told Kathy and Suzanne that I thought I could still win this race! If I could walk 100 miles in the last 24 hours (I had never managed more than 100km in the last day and wanted to walk 100 miles – I was dreaming), and they only walked 90km, then I could catch them. My day 5 mileage was only 27km! But I had been off the track for 18 or more hours. Going in to the last night I was still thinking that I could win, but it would depend on how fast I could walk and how much rest everyone ahead of me would need. I was confident that I wouldn’t need any sleep and decided that I would try and boost my pace by putting in a fast 5km at 10pm. 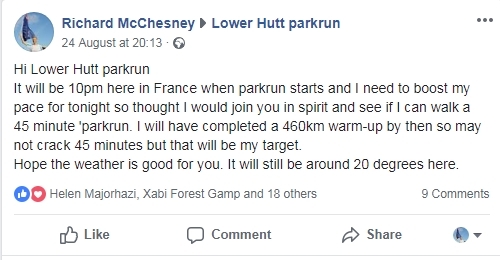 10pm Friday night was 8am Saturday morning in New Zealand, which is the time that parkrun starts in NZ. So I decided to pretend that I was walking the Lower Hutt parkrun, an out and back 5km along the path beside the Hutt river. 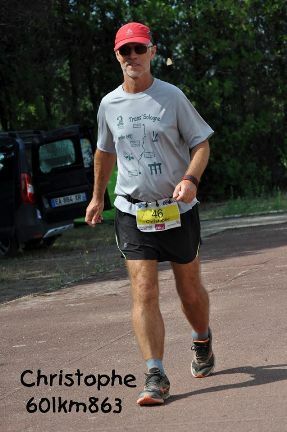 In my case each kilometre would be one lap of the 1,020 meter Privas track, and I hoped to walk the 5km in 45 minutes. For the last few hours I had been averaging 11 to 12 minutes per lap, so this would require me to increase my pace significantly, but I hoped that it would then result in me continuing through the night at a sub 10 minute lap pace. My ‘parkrun’ started at 10:03pm when I completed my 460th kilometre. My first lap took 9 minutes 40 seconds and took me from the Lower Hutt parkrun start line under the Ewan Bridge and up on to the stopbank and down to the 1km marker beside the retirement village. When I checked my km split time, and realised that I was going slower than I needed to, I increased the pace and started passing some of the other ‘parkrunners’. My next kilometre took 9 minutes and 5 seconds as we went down under the railway bridge and down towards the turnaround. I didn’t get a split time at the half way turnaround but reached the 3km mark in 27:40 after an 8 minute 55 second kilometer. The 4th kilometre at Lower Hutt parkrun is always the hardest for me. Back under the railway line and up the little incline back on to the stopbank for the final push for the finish. But I continued to increase my pace with an 8 minute 47 fourth kilometre. I was on fire now and kept increasing the pace before a final push to try and get under 45 minutes. My last kilometre took 8 minutes 38 seconds. I missed my sub 45 minute goal by 5 seconds. My ‘parkrun’ proved that this race is a case of mind over matter. Nothing changed physically but with some focus I managed to increase my pace substantially. During the night all five of those in front of me had sleeps of various lengths but by 6am they had all returned to the track and I began to realise that I was unlikely to win the race. 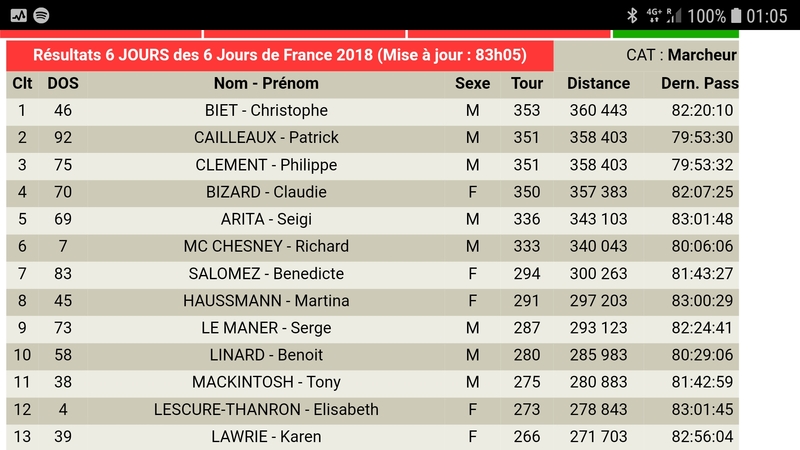 In fact I was still in 6th place and whilst I thought I had a good chance of catching Seigi (7km ahead), I was unlikely to catch Claudie (21km ahead) or Philippe, Patrick and Christophe who were all 50 to 52km in front of me. 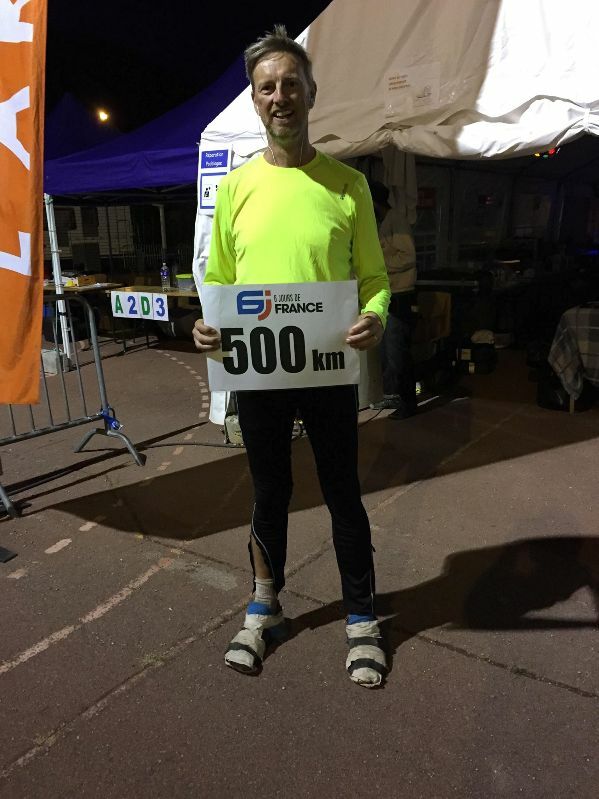 I reached 500km at 6:04am – 5 days, 16 hours and 4 minutes after we started the race. Whilst this was 23 hours slower than my 2016 500km split time, it was a new NZ M50 age group record and I stopped for a photo. 500km completed. Check out my footwear! Around 8am Marie Cain, one of the relay walkers started her next ‘leg’ of the relay just as I was finishing my lap and I decided to see if I could walk with her for a while. We walked a lap in a shade under 9 minutes. And the next lap was faster. And the next lap was faster again. And then I dropped Marie. Before I knew it I was lapping at 7:15 pace! I don’t know what happened. It was like I was possessed. The same thing had happened to me in the last half hour of the 2016 race when I averaged a shade over 6 minutes a lap for the last 5 laps. I didn’t get to that speed but I did manage 6 minutes 59 seconds for my 503rd lap! And, on checking the lap split times while writing this report, I see that the five laps from lap 502 to 506 took just 35 minutes and 41 seconds. That is a 35 minute 5km after already walking 509km in the previous 5 ½ days. It just shows what can be achieved with a focused mind. Eventually I came back to earth and my pace slowed, but by then I had caught and passed Seigi. Once I was back to a normal pace I stopped at the food tent and commented to Suzanne that I didn’t think I could catch Claudie (still over 10km ahead) but I was satisfied with how things were going and would just hold on to 5th place though to the finish. And then I saw Claudie sitting in the corner of the food tent looking like she desperately needed 8 hours sleep. That was enough. I was on my way again. Not at the same pace, but it was enough to start closing the gap on Claudie. 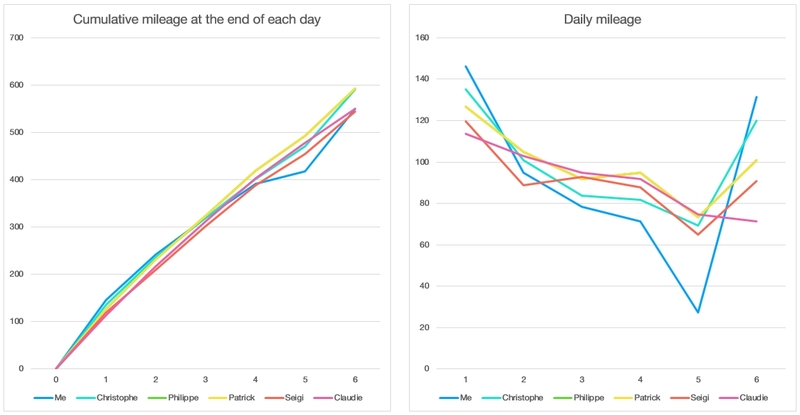 As the gap closed I worked out that because of the short laps during Thursday night, if I caught Claudie I would still be 400 metres behind her. I had to catch her and lap her, and then I would be 600 meters ahead. So that was my goal. When 2pm arrived I was 5 minutes behind lapping Claudie. If my maths is right, I was effectively 200 meters ahead of Claudie at exactly 2pm. But as the race had been extended by 2 ½ hours due to the storm delay on Thursday, the race wasn’t yet over and we kept walking. My official result at 6 days (144 hours) is 549.983km which is a new NZ M50 record. More importantly, on the last day I had walked 131.5km! It took about 1 ½ hours before I finally caught her, but once I did, I knew I was in 4th place, 600 meters ahead of 5th, and I just kept pace with Claudie through to the finish. 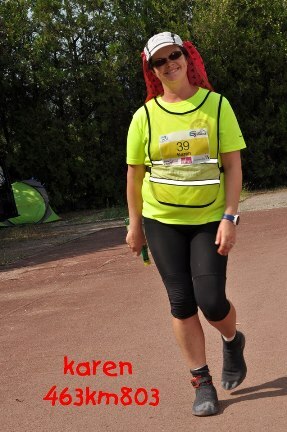 My final result was 564.602km – 4th walker and 16th overall. 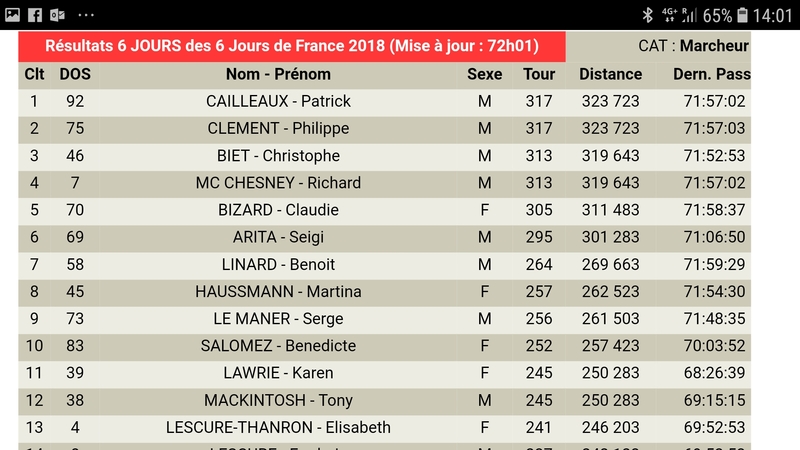 In the almost 30 hours since resuming the race I had closed the gap on the leaders from 76km to just 43km. I think this was my last visit to Privas. Or at least my last visit as a competitor. Or at least my last visit as a competitor this decade. 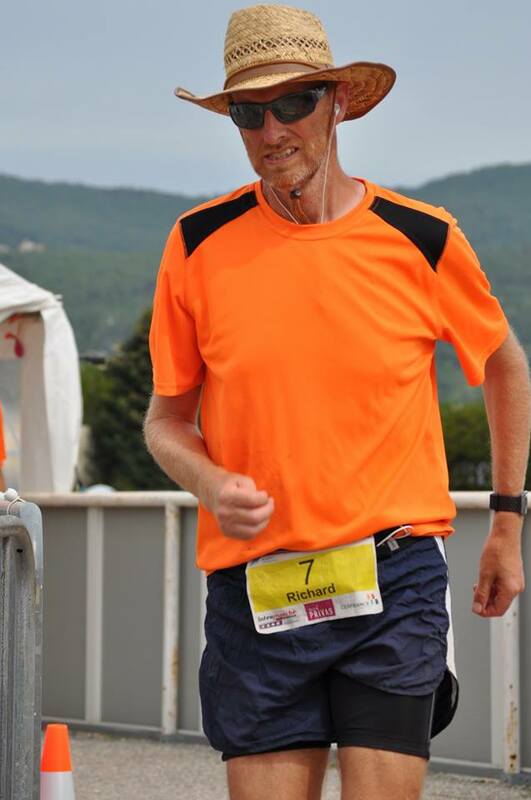 I have had four weeks to think about the race, and whilst there are a few changes I would make if I could go back and do the race again, I think I need a break from the race. The terrain ruins my feet. But I love the event itself, and hopefully next year I can go back as support crew for someone – or possibly to do the 48 hour race that will be held during the last two days of the six day race. The people are fantastic, and I think I would be miserable sitting at work for a week knowing that everyone else is there circling the track and suffering together. We had some great times during the week. One moment I remember was when I was walking with Karen who had already modified her shoes by cutting the front out of them and putting a pair of Tony’s socks over the top of them to keep the stones out. She was telling me that she was thinking of writing to the sock manufacturer to tell them that their socks didn’t last very long. We decided instead that she should put a review, along with a photo of her wearing the socks over the top of her shoes, on their facebook page. It doesn’t sound so funny now, but we were in absolute hysterics like it was the funniest thing anyone had ever said. As I say, we had some good times. 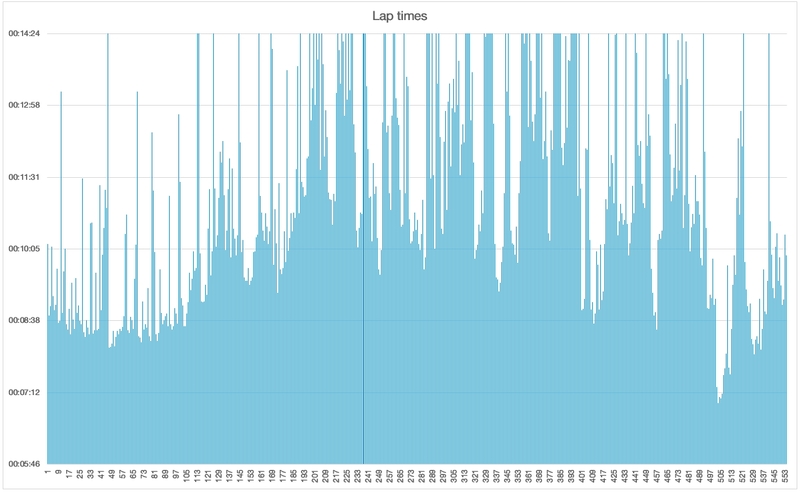 Having received the lap split times, I graphed them to understand what happened. The first 100 odd laps are mostly in the low 8 minute range. Thereafter, the lap times are all over the place but there are brief periods where my lap times improved significantly on the average and then drifted back again. And then there is the Saturday morning section between laps 502 and 512. The following are some of the photos that either I took, or others took during the race (most of the photos were taken by Sylvie Couturon). Karen celebrating breaking the British 6 day record with the whole team – other than me. I was busy chasing Claudie! I am hugely grateful to my good friend, Suzanne Beardsmore, who supported us throughout the race. She got plenty of exercise during the week making trips to the supermarket, bakery, and the local sports shop (to buy socks to go over my shoes). She kept us fed and gave us encouragement when we needed it. Thanks for everything Suzanne. I didn’t know any of the other 8 athletes who were standing next to me, but I was confident in my ability to outlast them in this elimination race in which competitors had to complete a 4.1 mile (6.6km) lap of a slightly undulating trail course every hour. If you didn’t complete the lap, or were not on the start line for the next lap at the start of each hour, you were eliminated. I hadn’t actually intended to start the mind games (or Trash Talk as one of the race directors called it) so early in the race, but I was feeling great and I wanted the other competitors to know that I was here to win. I first heard about the Last One Standing races about 18 months ago, and had been looking forward to doing one ever since. 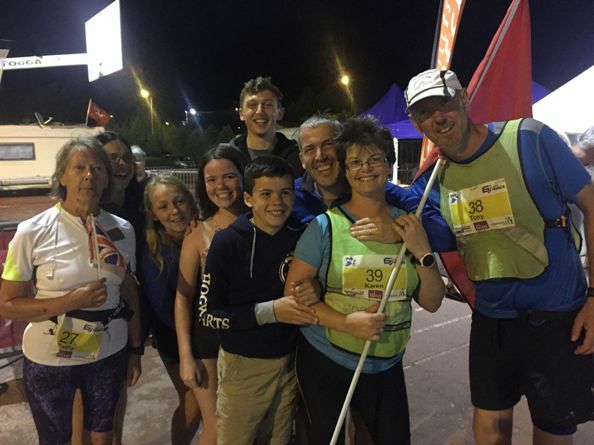 As a walker I can comfortably walk 4.1 miles in 50 minutes at a training pace, and having done 20 walks of 100 miles or further since 2013 I was confident that I could hold a 55 minute per lap pace for at least 40 hours – which I thought would be enough to win. The race was held in the grounds of Knettishall Heath near Thetford, about 2 ½ hours drive from home. My intention was to drive up after breakfast, arrive around 10’ish, pitch my tent and then relax until the 12 noon start. But after waking at 4:30am and not being able to get back to sleep, I decided to head up there early, and after setting up my tent I had time to walk the local parkrun (my 115th different parkrun to date, and 365th in total), before going to McDonalds for a second breakfast/early lunch. 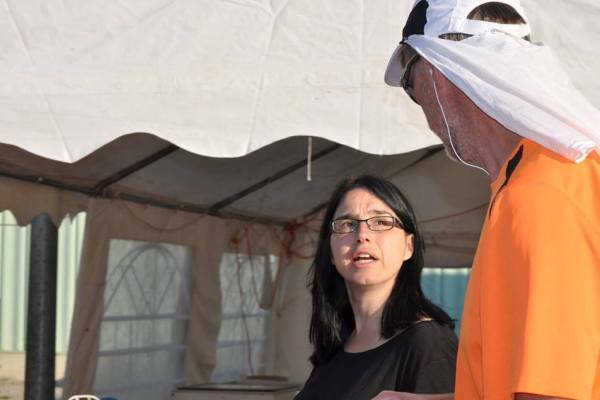 I got back to the race venue around 10:30’ish and set about making final preparations – laying all my food out on the camping stretcher I had set up in my tent, sorting out spare clothes, head torches, etc, and preparing my feet for the upcoming race. 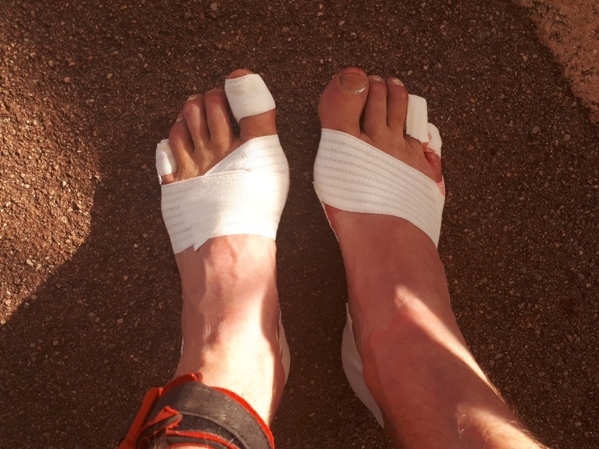 I still had missing skin on the insides of both heels after blistering in both of my previous two 24 hour races (this would be my third race of 24 hours or longer in 7 weekends) so I taped over the damaged areas and coated my feet thoroughly with 2Toms Blister Shield. As usual I then put on my Injinji toe liner socks and another thin pair of socks over the top. I ate some more food, getting in as many calories as possible before the race started, and at 11:30 we were asked to assemble for the pre-race briefing. The race was organised by Atlas Running (who put on the Dublin to Belfast race that I competed in last year) and Challenge Running (the people behind the Thames Ring 250 which I DNF’d last year). Both Lindley (Challenge Running) and Sammy (Atlas Running) talked about the event and Sammy said that the magic number was 53. He was speaking to the runners (I was the only walker competing) and was telling them to slow down, walk heaps, and aim to complete each lap in around 53 minutes. The idea being that there was no point in using too much energy running too fast and resting for longer than 7 minutes between laps would result in muscles getting tight, especially overnight when it would be colder. My plan was 55 minutes per lap. Like most of the other competitors, I hadn’t competed in a race of this type but in almost all my long races I had avoided sitting down at any time between the start and the finish, and I figured that resting for more than 5 minutes between laps would be too long to rest without wanting to sit down. Just before 12 noon we assembled on the start line and shortly afterwards we were on our way. Out the gate, around to the left and left again, and down past the back of the ‘campsite’. I settled at the back, walking just fast enough to ensure that I kept the last of the runners in front of me in sight. I didn’t want to get lost of the first lap and miss the 1 hour cut-off! The course followed a river for about 1km before heading into the trees and a reasonably steady incline up to the first landmark. I figured that it was important to find landmarks and use them as timing checkpoints so that as the race went on I would know if I needed to speed up, or whether I had time up my sleeve. The first landmark was a road we crossed and a car park across the road. On my first lap I reach the carpark in around 16 ½ minutes. After exiting the car park we had an exposed trail section that was slightly uphill before entering the forest again. This was the only exposed section on the course. Almost all of the rest of the course was sheltered under trees. About 4 1/2km into the lap we reached the next landmark. This was the top of the course immediately after the only hill that was slightly steep (a hill that got steeper and steeper with every lap). We went through a gate, turned left and down the road for about 50 meters before crossing in to a trail through more trees. I reached this landmark in around 37 minutes and calculated that I had plenty of time to ease up as I walked downhill along the trails to a third landmark which was another stretch of road of about 200 meters through to a cattle grate and a left hand turn back into the trees. Six minutes later we crossed one last road back into the area where I had parked my car, and a few minutes later we reached the end of the lap. In my case, in last equal place, in a shade over 54 minutes. Six minutes later it all started again. I used the first four or five laps to experiment with different paces, starting slow, starting fast, and getting an idea of the range of acceptable times at each of the landmarks – the first car park in 17 to 19 ½ minutes, the gate at the top of the hill in 39 to 41 minutes, the cattle grate in around 47 or 48 minutes, and I also worked out that I needed about 2 ½ minutes from when I crossed the last road to get through to the finish. 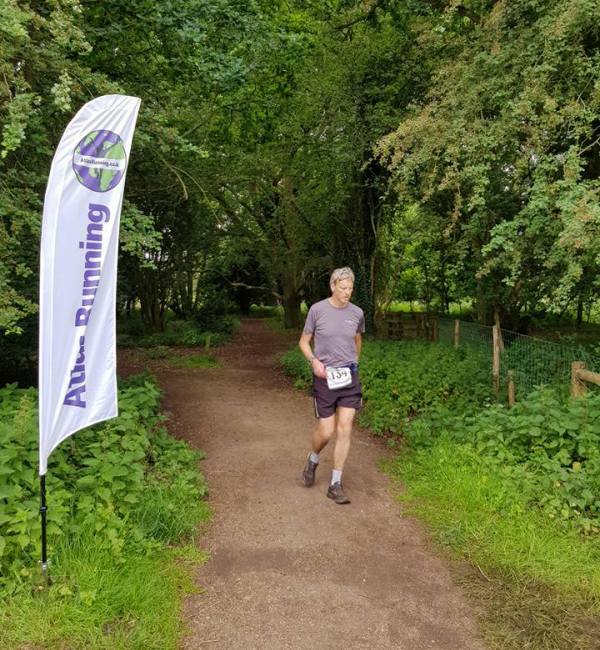 Whilst I don’t run at all, I decided that if I got to that last road crossing with less than 2 ½ minutes to go, I would run through to the finish if I had to, but in the early stages I had plenty of time available. I was really enjoying this race. Most laps I would finish last but often I would talk to other runners at some stage during the lap, and then every hour we would all assemble for the start of another lap. 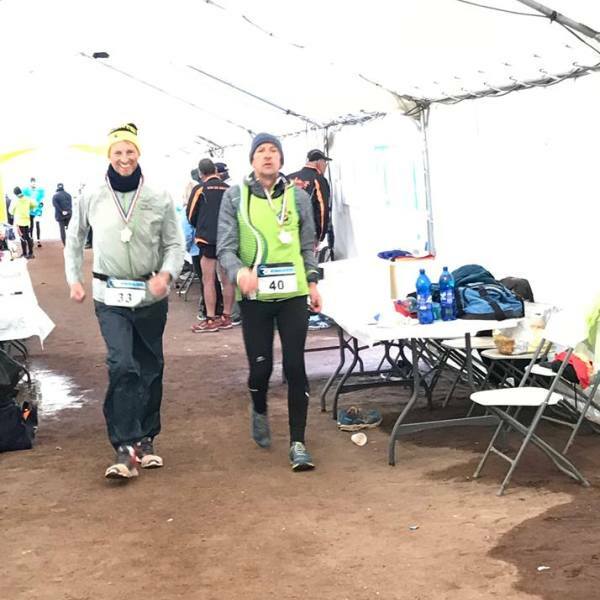 More importantly, unlike most races where regardless of the pace I am usually struggling a little after six to eight hours, ten hours in and I was feeling like I had just started. These short rests were working well. In addition, I was still mixing the pace a little. Most laps I would walk easy for the first kilometre while having something to eat, and then once we turned away from the river I would pick up the pace and walk hard through to either the gate at around 41 minutes, or to the cattle grate. Based on my time at these landmarks I would then walk slowly and relaxed through to the end of the lap, completing almost every lap in 55 minutes and change. Twelve hours passed and a few runners has dropped out. I was still feeling great but was having to walk a bit harder to maintain my 55 minute pace solely because I always walk slower at night, and the nature of the course meant we had to take a little extra case with out footing in the dark. It started to rain lightly during the 12th or 13th lap, but nothing to worry about, and it only lasted a few laps. When dawn arrived, I was still feeling very relaxed. These five minute rests and the mixed pace were suiting me perfectly. I was still listening to podcasts and still avoiding sugar. I think I had a celebratory Coke at twelve hours, but I didn’t yet feel the need to turn on the high tempo music and switch to my Coke and Chocolate diet which usually both happen around 12 hours into a race. I had a few hours of feeling a little tired just before dawn, but nothing to be concerned about. Mid-way through lap 19 I went from feeling good to struggling. I was feeling good still, but my pace had dropped. I reach the gate at the top of the hill in a shade under 43 minutes. My slowest time by well over a minute. I immediately switched from listening to podcasts to high tempo music and it was like I had flicked a switch. The result: My first 54 minute lap in 12 hours, and I passed three runners in the last 2km. 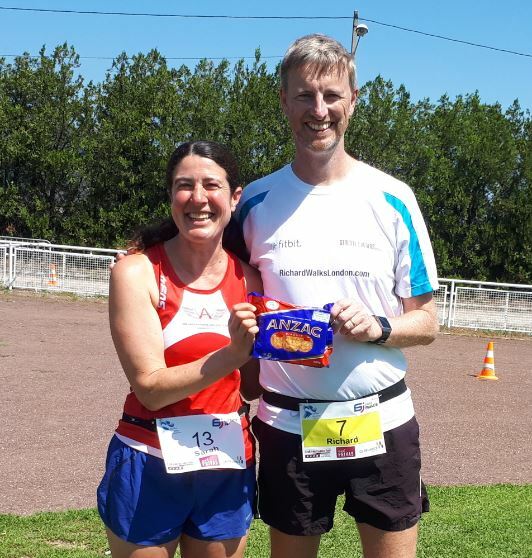 On completing the lap I had my second can of Coke and first chocolate bar, and from there it was high tempo music for the rest of the race, although I continued to eat and drink a range of foods rather than my usual diet of sugar only from the last half of a race. I didn’t know how long this race would take, so didn’t want to switch to sugar too early. By now there were only 15 competitors left in the race. The start of each lap was much more relaxed. The runners were tiring and not starting as fast. I was still finishing last or near last on most laps but during the first kilometre there were usually runners to talk to. The drop outs appeared to be more a case of runners refusing to start the next lap rather than being timed out. Every time we lined up for the next lap I would count how many were left. It was funny how time meant nothing. I was focussed solely on the lap I was on. Focussed on one hour at a time. And that brings me back to the start of lap 25. This was the 100 mile lap. I knew that a few runners would drop out after this lap. 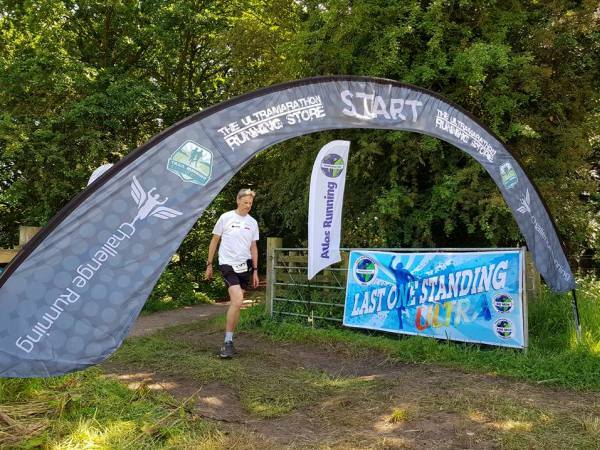 Some had told me that they were ‘only’ aiming to complete 100 miles, and for others I got the impression that the race was taking more out of them than they wanted, and with Sunday morning turning into a hot, sunny afternoon, they wouldn’t last much longer. I didn’t intend to mess with their minds, but I was feeling great. I was really enjoying the race, and I desperately wanted to win. Only 7 of us lined up for the 26th lap, and 5 for the 27th lap. At the end of lap 28 two of the runners told me that they weren’t going to continue. I walked over to Richie Hinson to ask if he was going to continue. I’m not sure what was on his mind, whether he was intending to continue or not, but a few minutes later Richie and I were the only two standing on the start line for lap 29. We had been racing for 28 hours already. It was 4pm on Sunday afternoon. Richie took off at the start of the lap and I continued with my ‘routine’. Walk easy for the first kilometre, pick the pace up through to the top of the hill, ease up a little through to the cattle grate, and then walk easy to the finish. Another 55 minute lap completed. On the next lap, lap 30, coming down the hill I saw Richie ahead of me and decided to ‘race’ him. I went past him and opened up a gap, but then he came back past me again. He wasn’t as tired as I thought he was. I continued to walk reasonably hard but let him go, and ended up with my first and only sub 54 minute lap. My fastest lap of the race after 30 hours. I still had plenty of energy! On completing the lap I walked up to Richie and told him he should give up now. I said that for every lap he did, I would knock off another 55 minute lap, and when he was finally finished, I would do one more lap to win the race. I apologised to Richie the following morning. I was desperate to win, but the trash talk was probably unnecessary, and uncalled for. A couple more laps in which Richie finished a few minutes ahead of me, and then it was dark again. 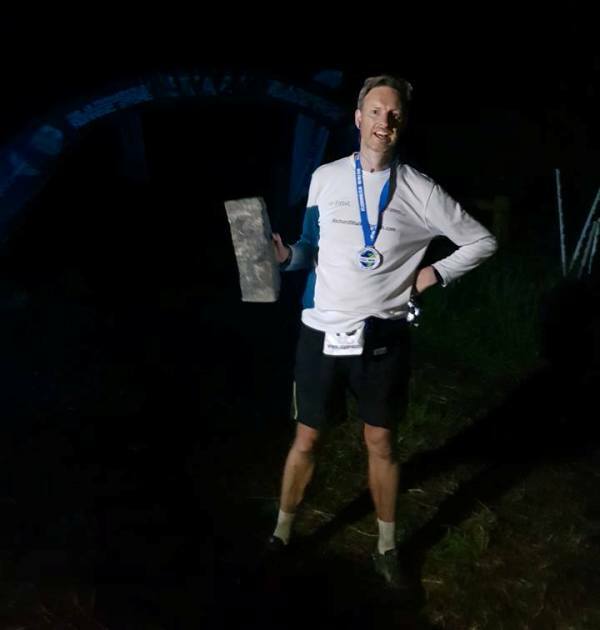 Whilst it was daylight in the exposed areas of the course until about 10:30pm, it was dark enough when in the forest to need head torches from 9pm (lap 34). The darkness was almost the end of me. I completed lap 34 in 57:18, my slowest lap of the race to date. More importantly, in my mind, it was after Sammy’s 3 minute call (Sammy counted down the minutes to the start of each lap and this was the first time I wasn’t there for the three minute call). I wasn’t sure if Richie was taking notice, but if he realised that I had taken over 57 minutes to complete the lap, then he would realise that I was struggling. I wasn’t actually struggling though. I still felt good, but the darkness, and the fact that I was walking alone and didn’t have others to follow in the darkness meant I had to focus more on my footing on the trails, and as a result I was losing time. When lap 35 started I walked hard from the start. No taking it easy for the first kilometre or the last bit. I completed the lap in 56:10. Not a 55 minute lap, but not a 57 minute lap either. I walked over to my tent and collected some more food, and then back to the start line. Richie was sitting on the seat that he had sat on at the end of many of the last few laps, but this time he had a jacket over his shoulders. I didn’t think anything of it and prepared for the start of the next lap. I didn’t expect what happened next. With a few seconds left before the start of lap 36 Richie walked up to me and shook my hand. “Congratulations”, he said. He said he wasn’t going to continue. I had won the race! Well I hadn’t actually won the race yet. We had both completed 35 laps. If I didn’t complete another lap in less than one hour, we would both be awarded DNF medals. Eight hours earlier, when I thought the end of the race was near, and it was still daylight, I decided that if I got to the stage where I was the Last One Standing, I would walk as hard as I could for the last lap, and hopefully walk a sub-50 minute lap to finish the race. It was dark now, but I still thought a fast’ish lap would be possible. I started hard and passed through the first car park in 17 ½ minutes. But by the time I reached the gate at the top of the hill I had lost a lot of time and a 55 minute lap would be the best I could hope for. I decided to ease up a little as I didn’t want to risk something going wrong during the last 2km. Instead of walking hard, I enjoyed the last 15 minutes, walking along trails I had already walked 35 times over the last 1 ½ days. In a way, I didn’t want the race to finish. I wanted to win this race from the day I first heard about it, and I had done it. I finished the lap in 57:10, my second slowest of the race. But it didn’t matter, I had won. My first win on British soil, and it was a race in which a walker had beaten all the runners! Finished!! Holding the winner’s trophy. After reaching the finish there were a few photos and a lot of ‘congratulations’. Most of the competitors had gone home long ago and those that were still there were as tired as I was. I walked over to a chair and sat down for a few minutes. The first time I had sat down in 36 hours. After a few minutes everyone headed off to their tents to get some sleep and I did the same. I was wide awake. I hadn’t felt tired since the early hours of Sunday morning. Probably a combination of sugar and adrenaline (it is funny how when a race goes well you feel great) meant that I didn’t feel tired at all. Once I got into my tent I changed my clothes and climbed in to my sleeping bag to keep warm, and the next thing I knew it was about 3am. Every muscle in my body was now sore and I struggled to sleep for the next few hours before getting up at about 6am and starting the job of packing everything back into the car as quietly as possible so as not to wake anyone. Breakfast would have to be one of the highlights of the race. Maxine, from Challenge Running, cooked enough bacon butties to feed an army. It was the first decent meal I had had since my visit to McDonalds on Saturday morning, and was the start to my post race recovery. I am writing this race report 12 days after the race finished. I start my training again tomorrow having had a good break to recover. The strange thing is, that almost every night since the race I have had strange dreams involving me walking through forests. I’ve had dreams about races in the past, but not every night for 1 ½ weeks. This is a unique race. It isn’t about speed. It is 100% about endurance. All you need to do is complete 4.1 miles within an hour and repeat. In my past races I gone out much faster than 4.1 miles per hour, but would have had periods much slower than 4.1 miles per hour later in the race. This was all about consistency. I spent the first 5 or 6 laps learning about the course. I worked out the time range I needed to be within at each of the ‘landmarks’, how it felt walking at different speeds on different parts of the course, and how to make the most of my time during the 5 minutes I had at the end of each lap. I strongly believe that the moment you sit down during a race, whilst it might feel good to rest, your muscles start to seize up and getting started again is much harder. Right from the start I walked a pace that kept the rest periods to around 5 minutes. Early on I thought 6 minutes might be better, but I got into a routine that ensured that 5 minutes was all I needed, and even if I had wanted to, I didn’t really have time to sit down. There was never a time that I thought about how many more laps we had to go, or how many more miles we had to go. Partially because I had no idea, but also because I focussed 100% on the current lap only. On the occasions when things were getting tough I would remind myself why I was doing this race, or why I wanted to win. One reason I wanted to win was that I had seen a photo of the winner’s trophy and I really, really wanted it. Another reason was that I had promised my wife that I would win. She is my biggest supporter but she also knows my weaknesses and didn’t think this was a race that I could win. I wanted to prove her wrong. And having done parkrun on Saturday morning, I kept reminding myself that if I didn’t win, someone would tell me that I shouldn’t have been so cocky as to do parkrun before the race. I started the race fully expecting to take at least 40 hours. I have often wondered who a tennis play can go on court not knowing whether they are going to be playing a quick 3 set match, or a long drawn out 5 set match. Mental preparation. Prepare for a long 5 set match and if it is a quick match, then that is a bonus. I thoroughly enjoyed the race. I didn’t have a negative thought or bad patch during the whole race. I can’t say this about any other long-distance race I have ever done. I don’t know if this helped me win or not, but I was treating the later stages of the race as a game. I wanted to win the game, and playing mind games might put doubts into the minds of the other competitors. 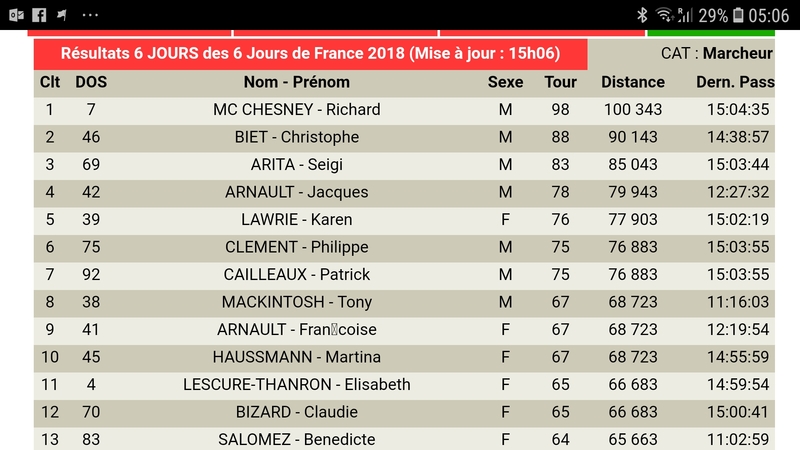 My next race is the Privas 6 day race in France starting on 19th August. It will be my third 6 day race and I am seriously considering implementing what I learned during Last One Standing with respect to taking regular five minute breaks. 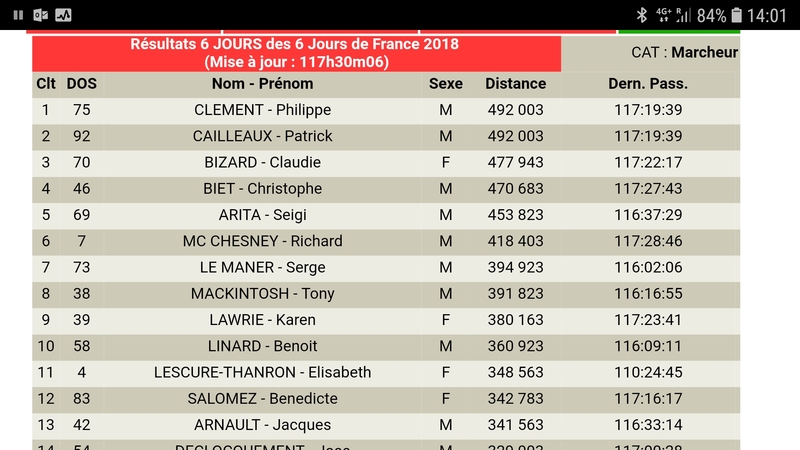 After taking a two week rest break I will resume training with an easy week during the last week of June and then four or five weeks of high mileage before easing up over the last few weeks before Privas.